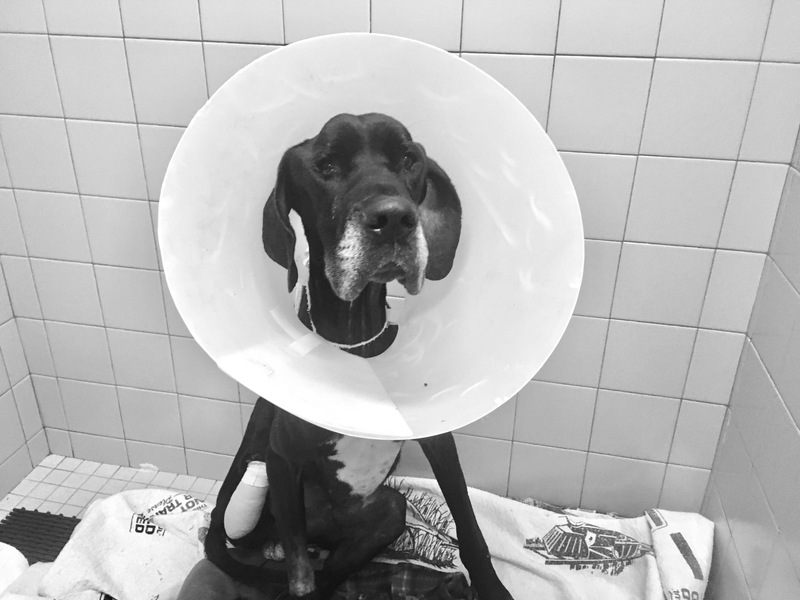 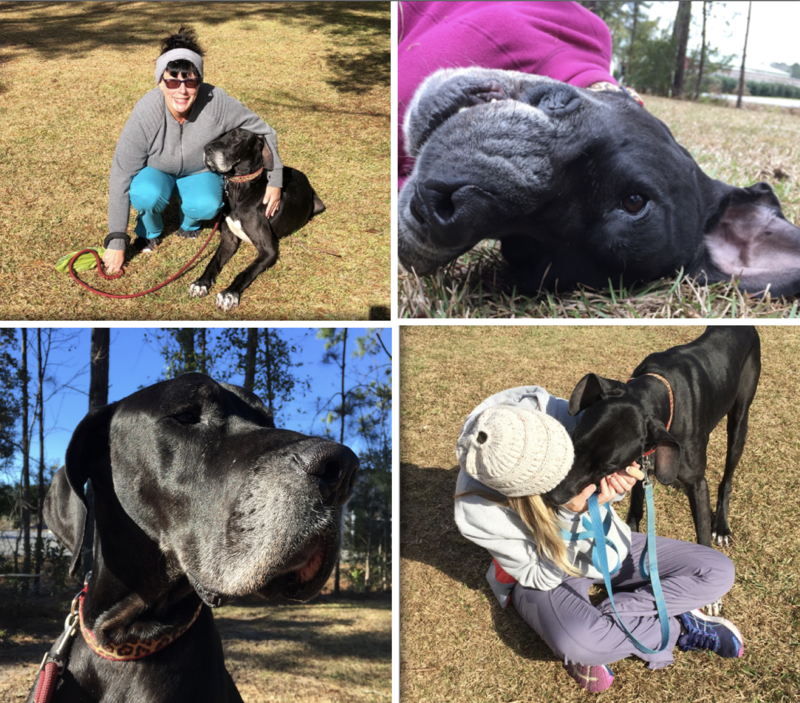 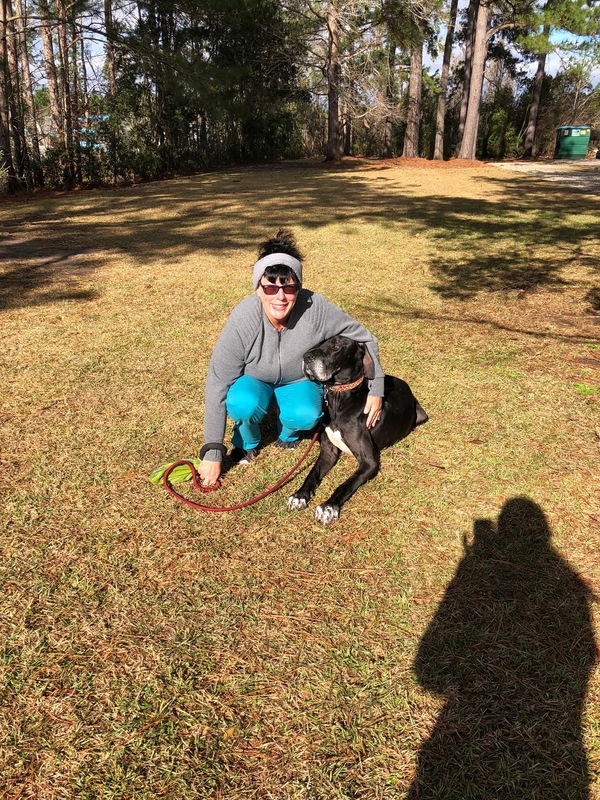 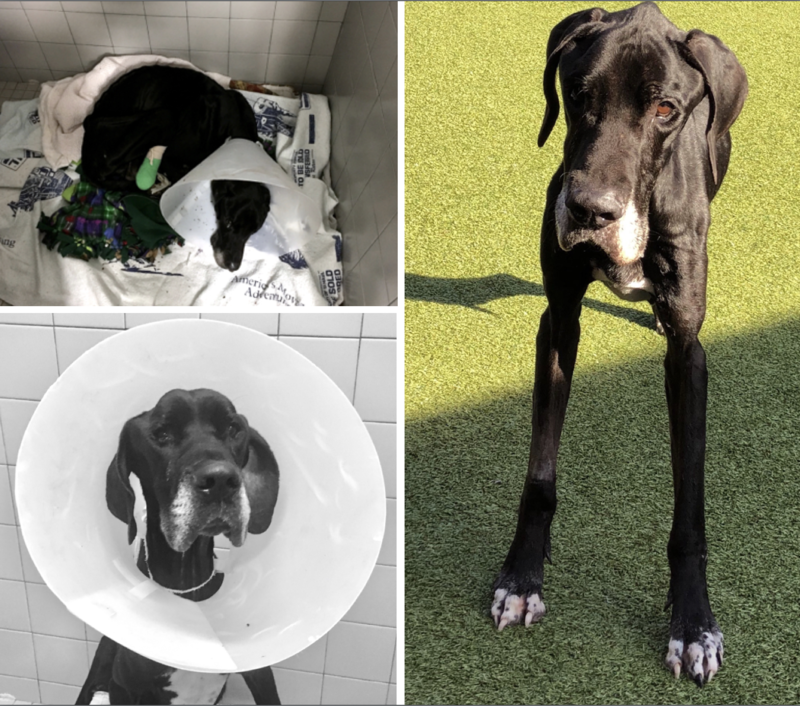 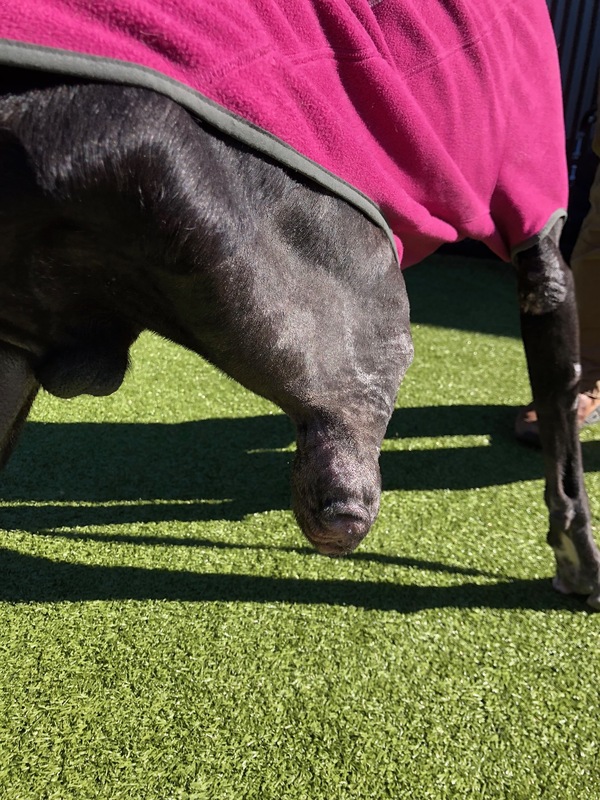 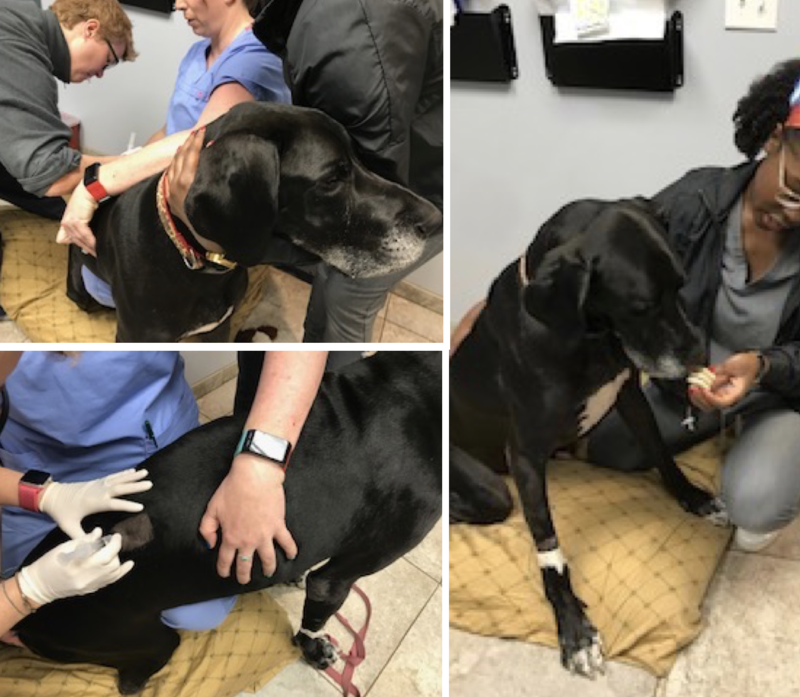 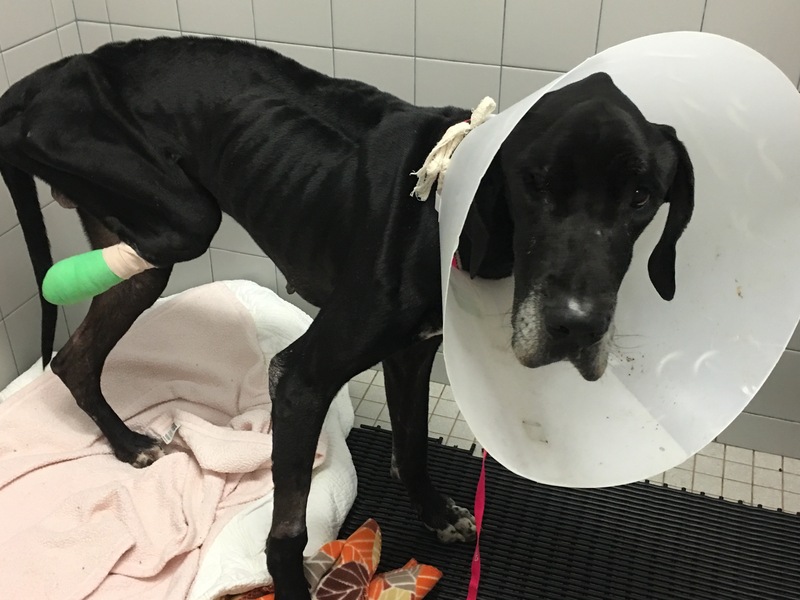 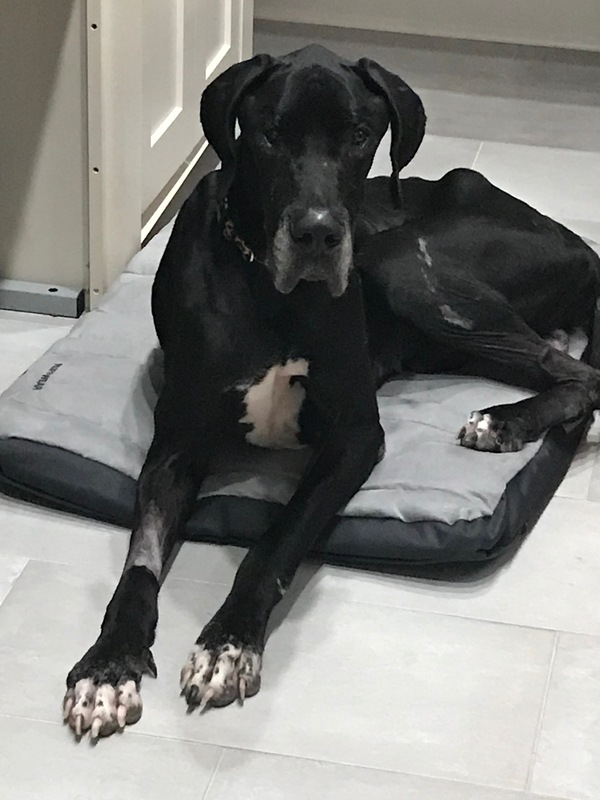 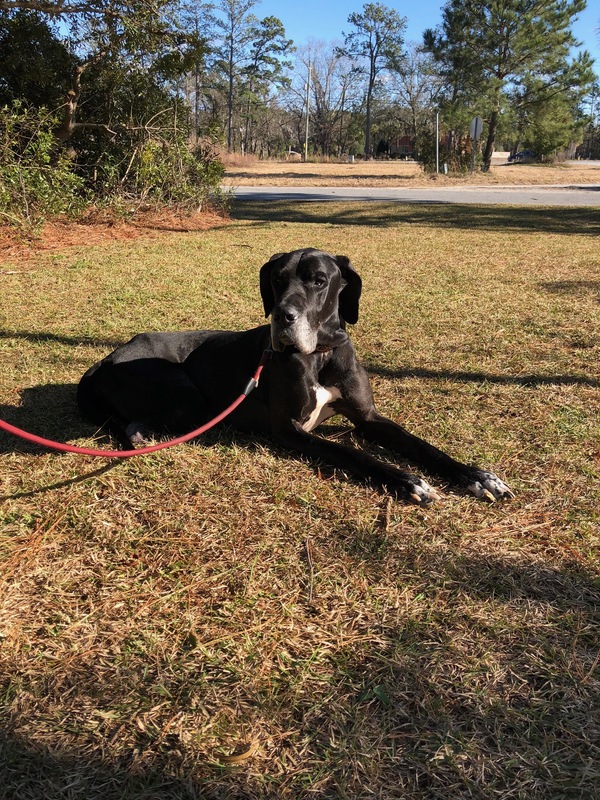 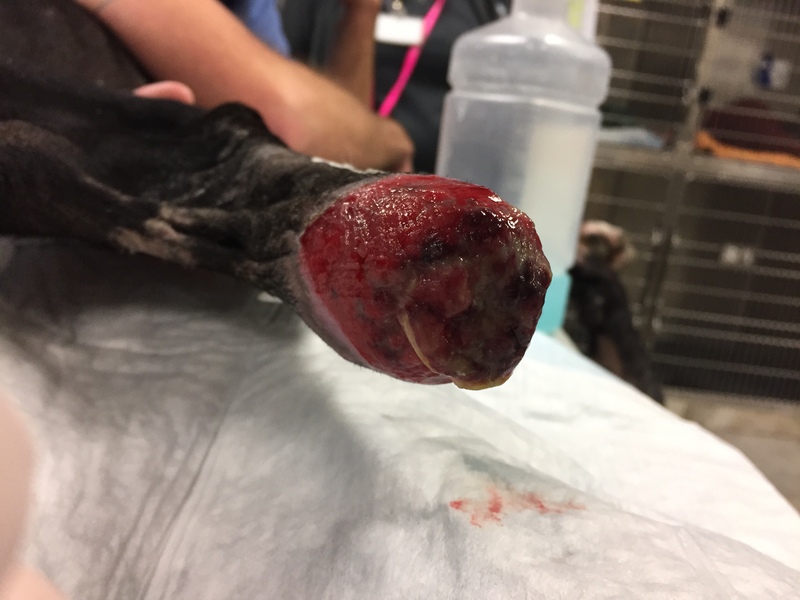 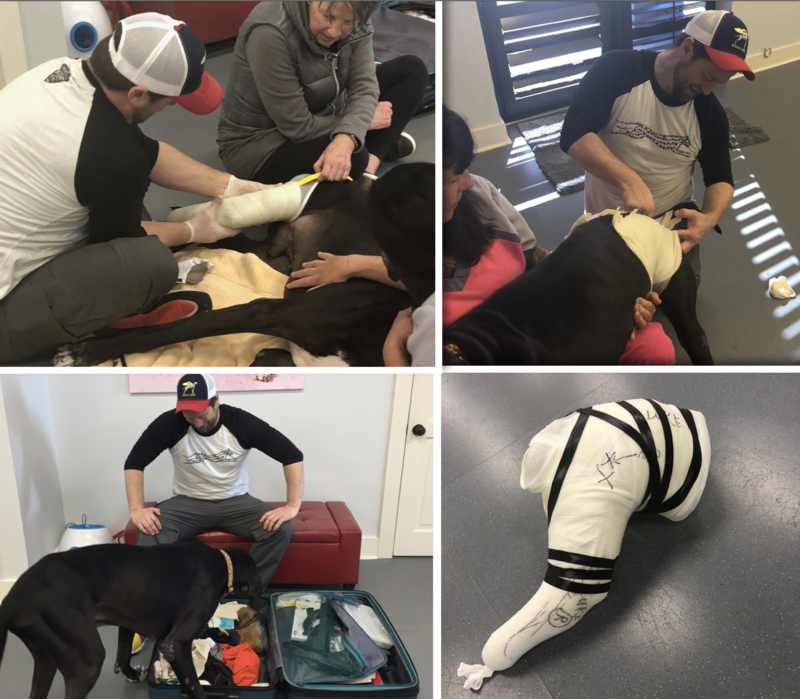 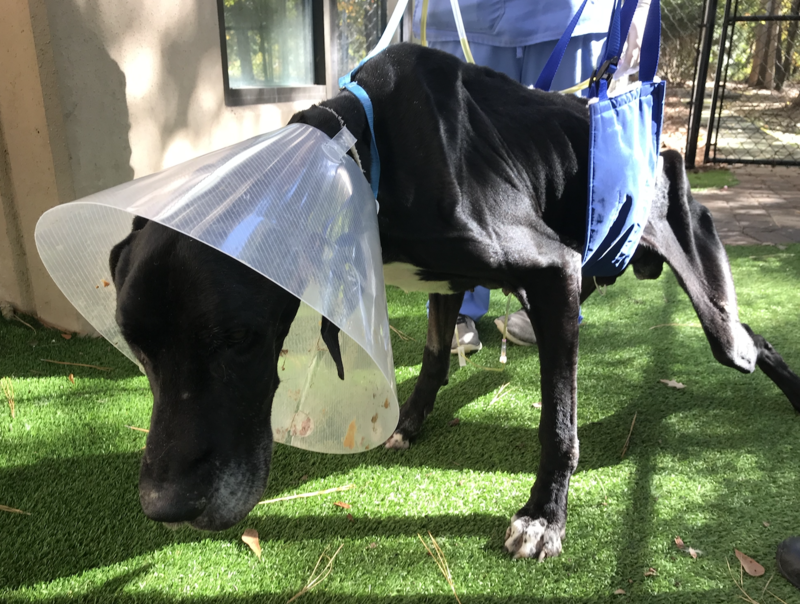 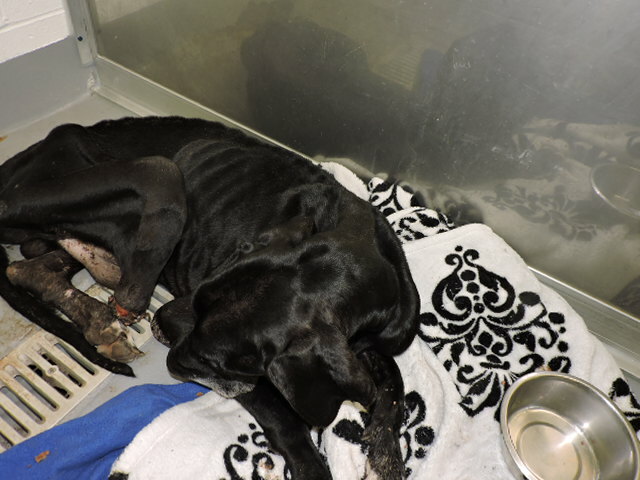 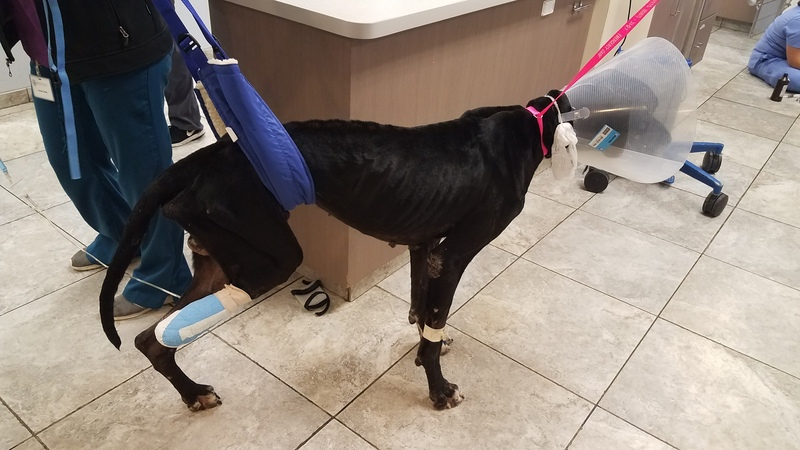 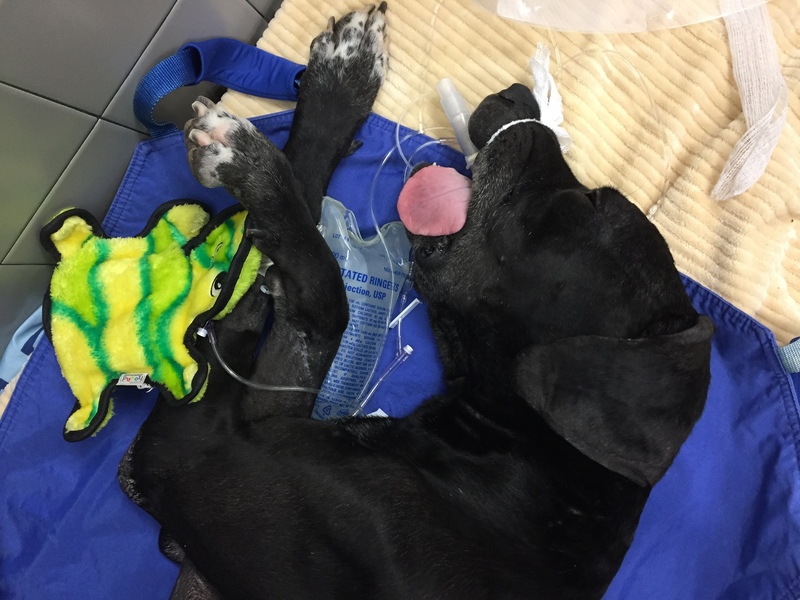 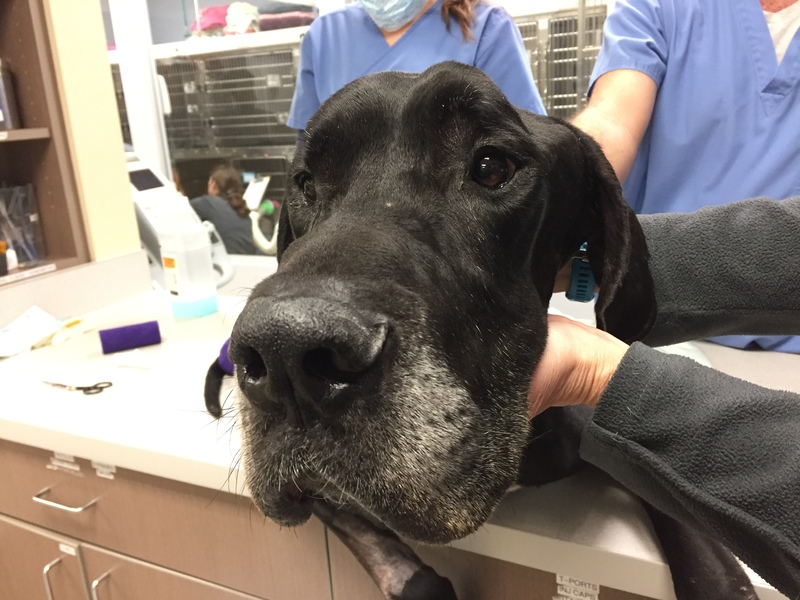 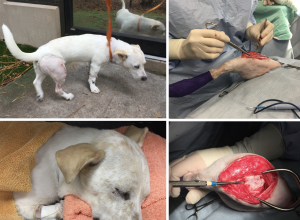 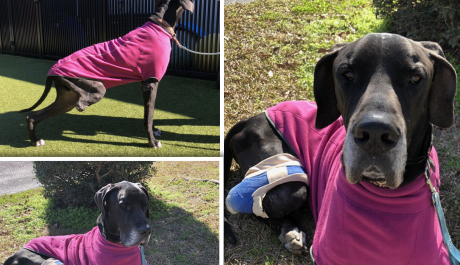 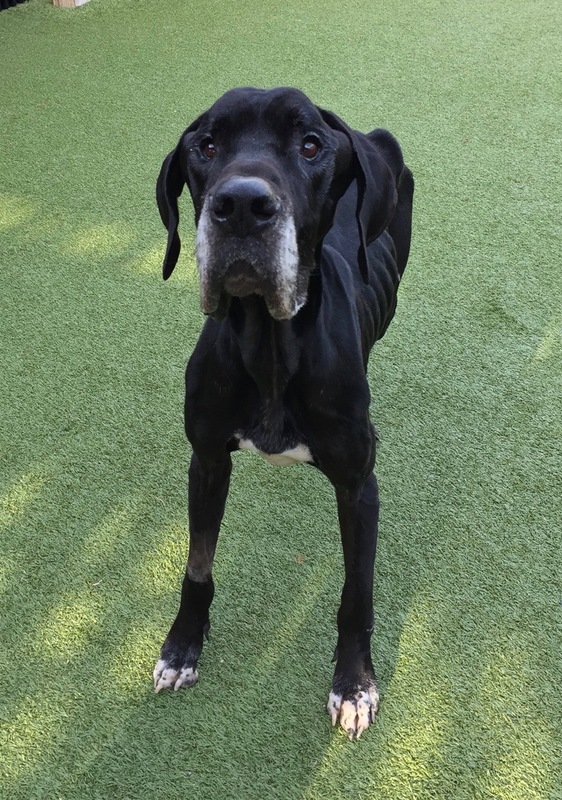 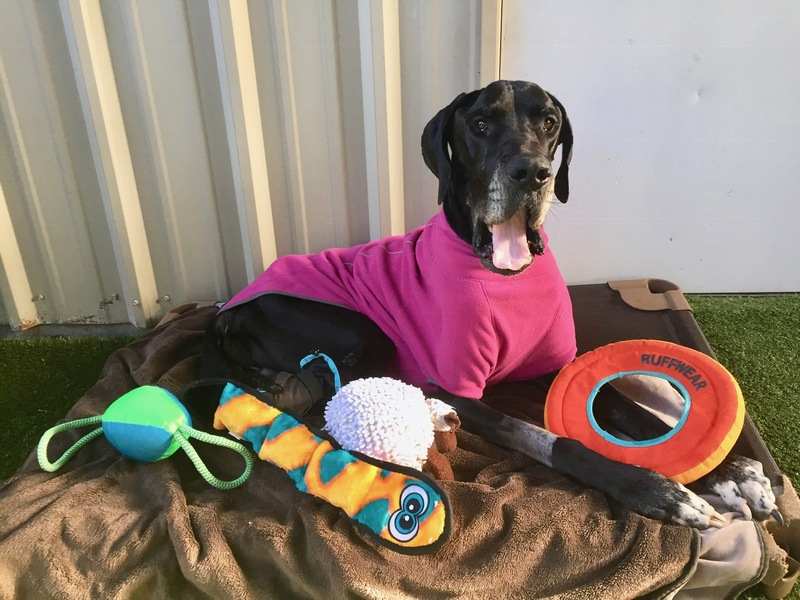 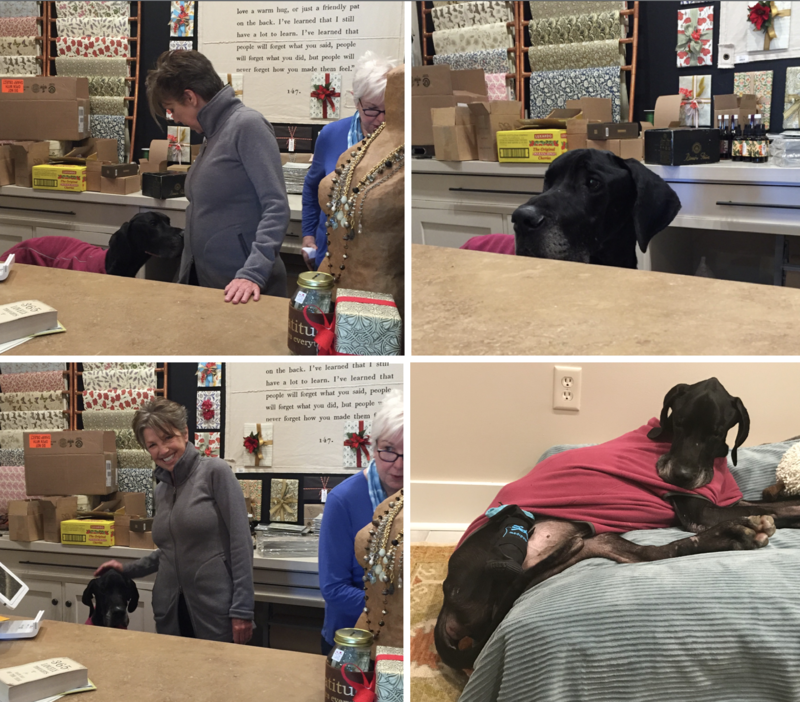 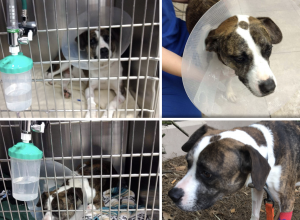 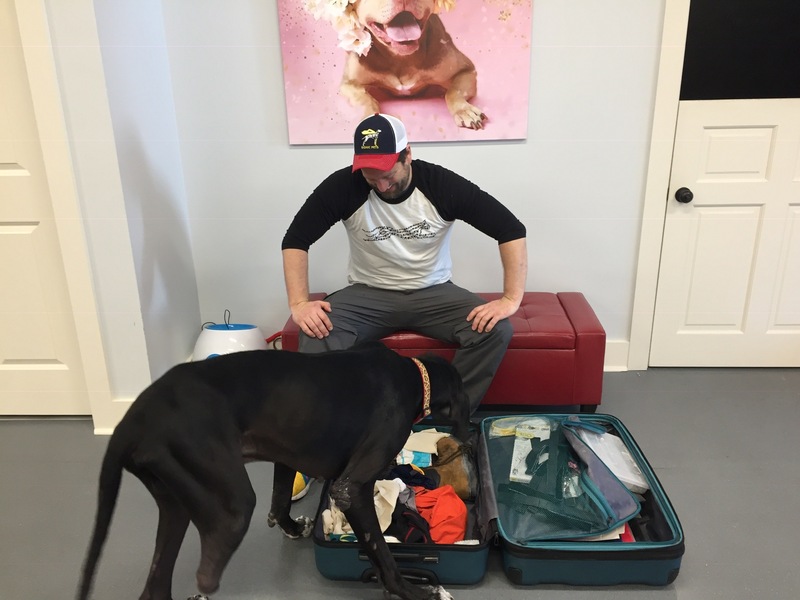 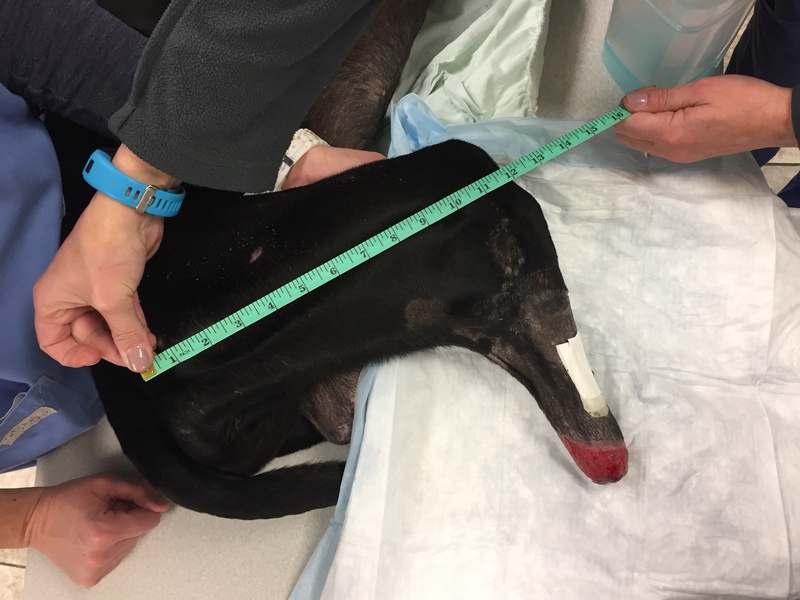 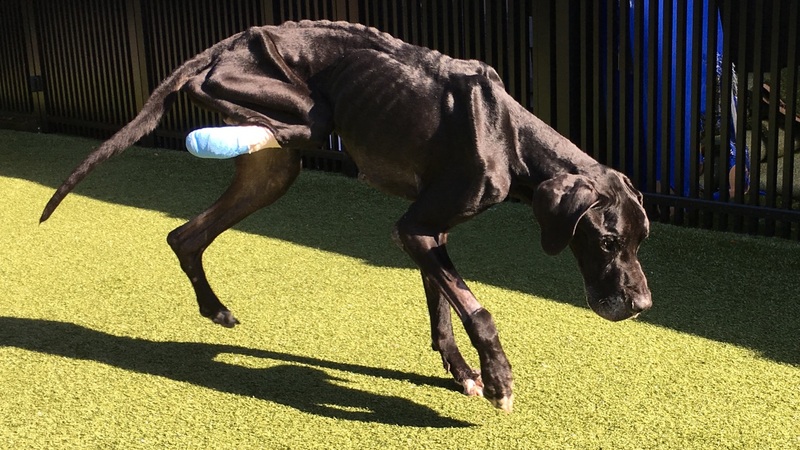 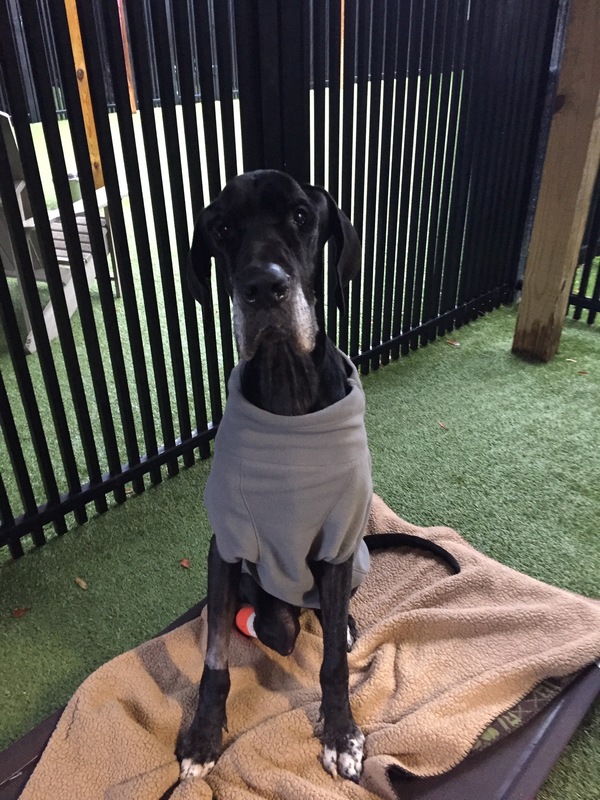 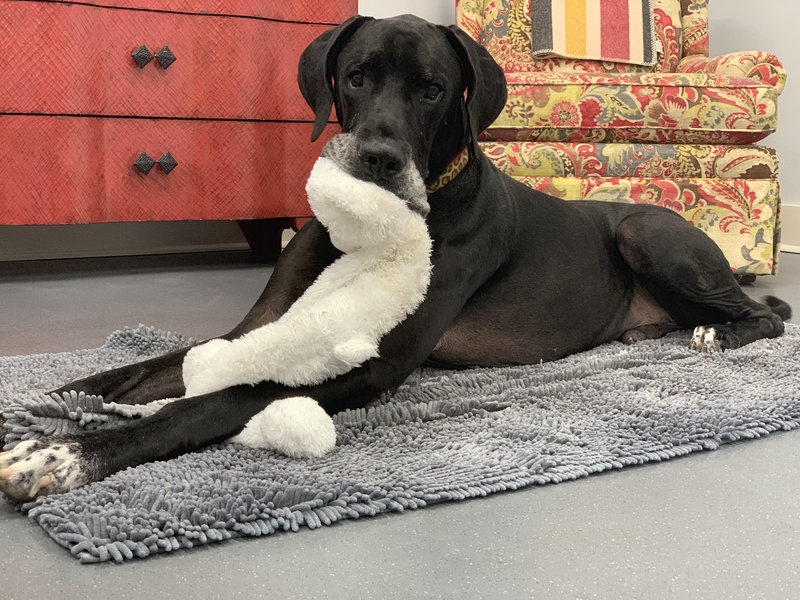 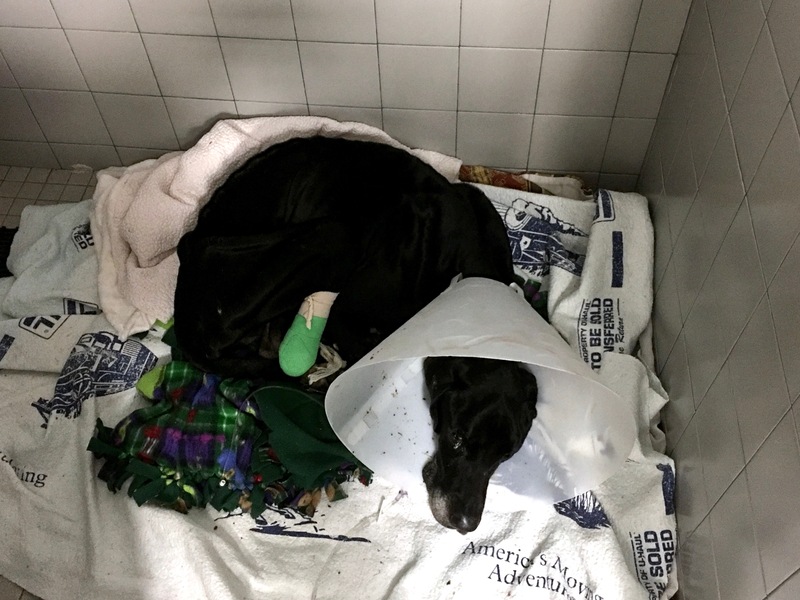 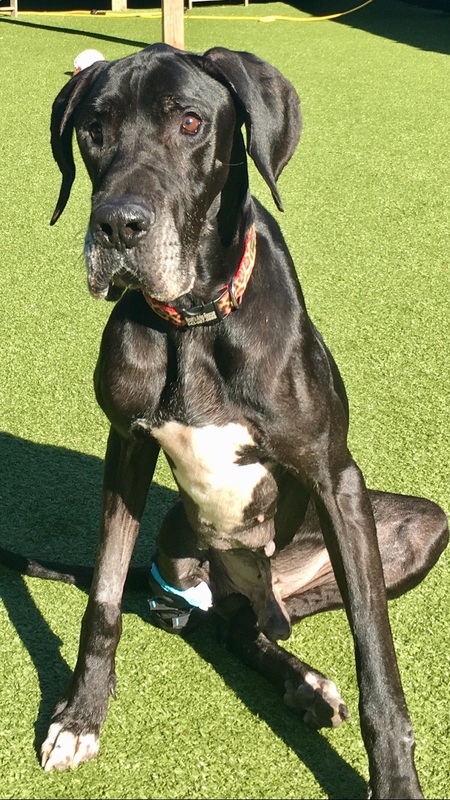 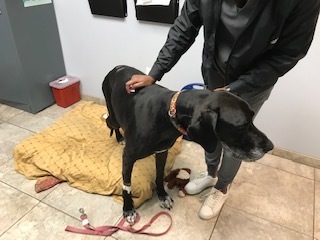 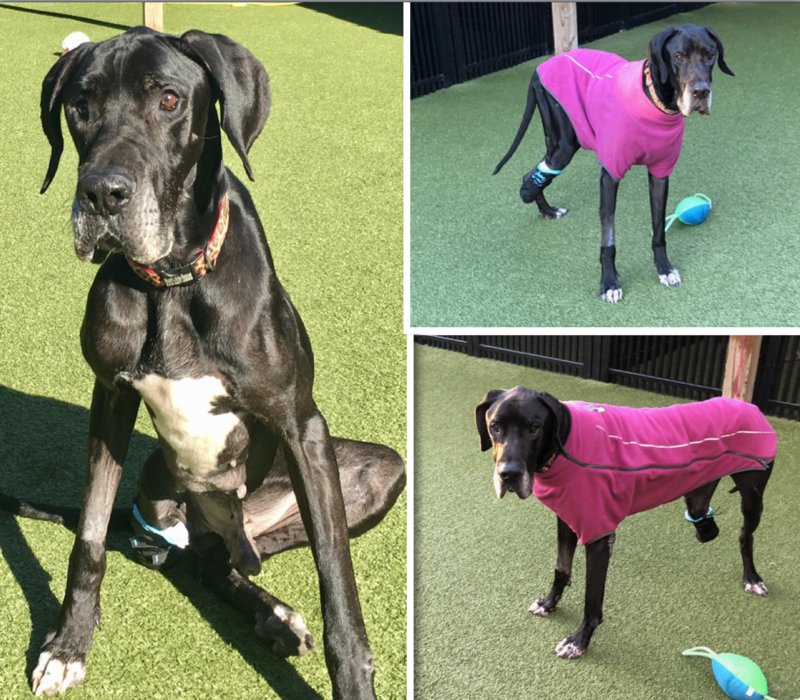 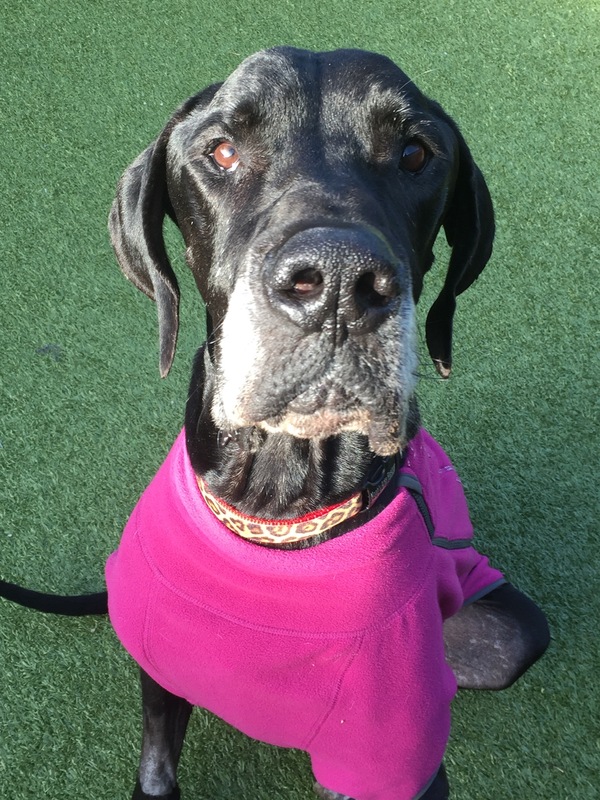 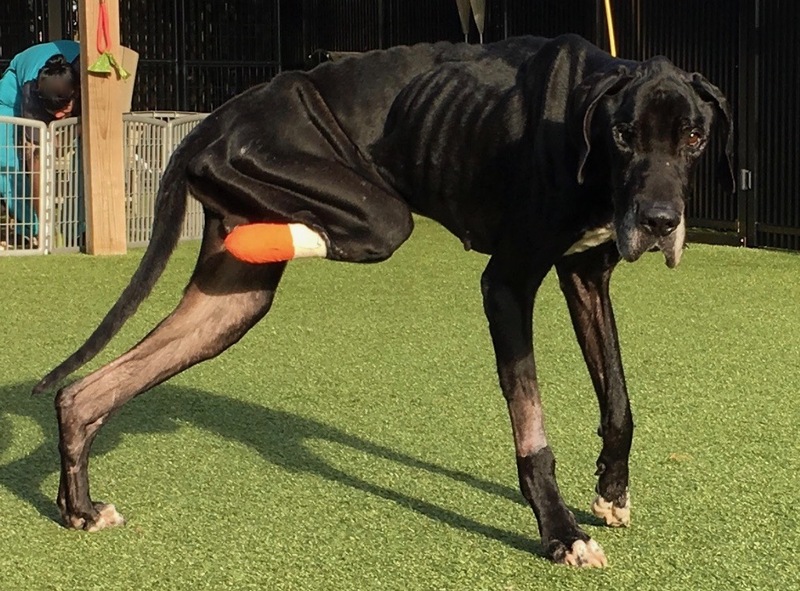 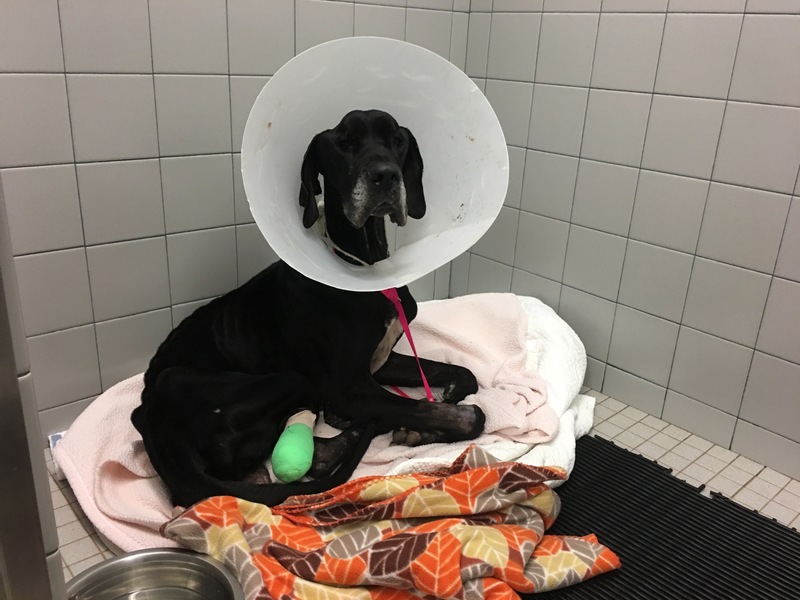 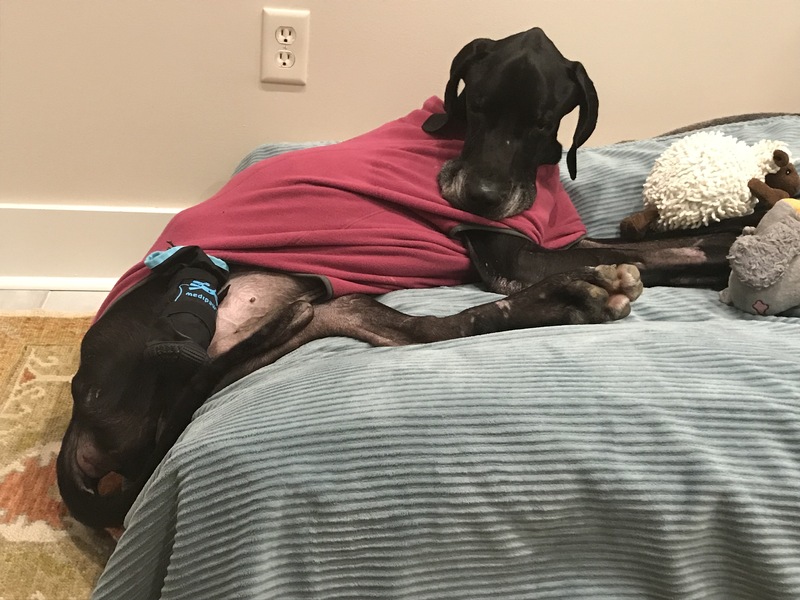 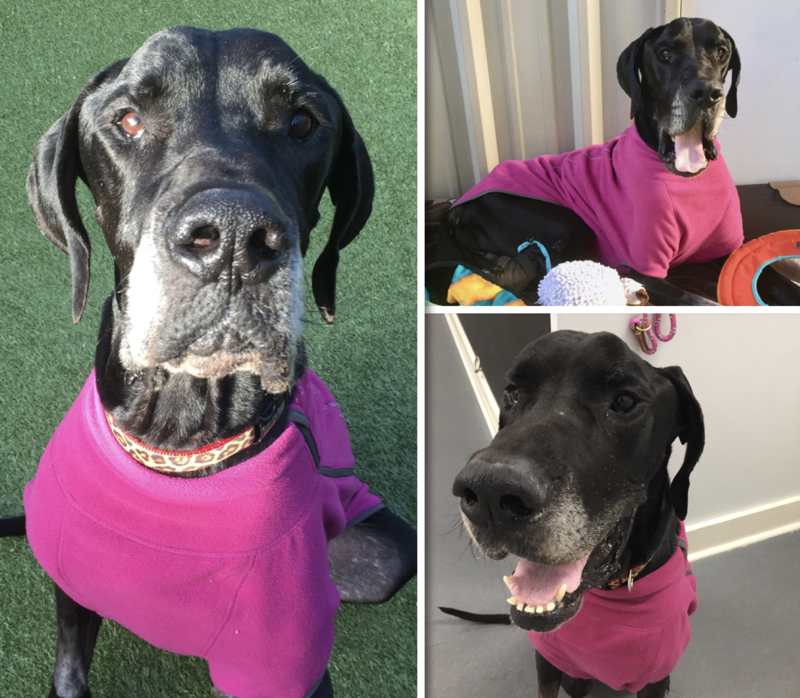 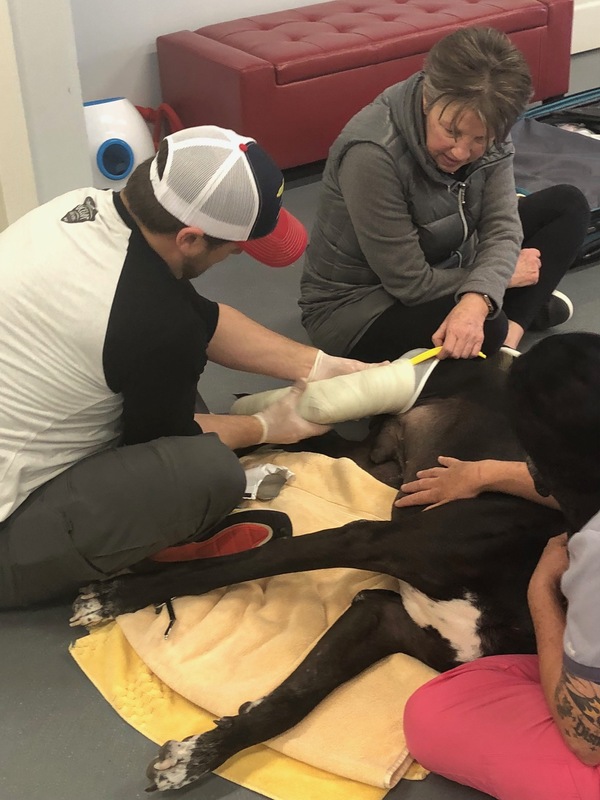 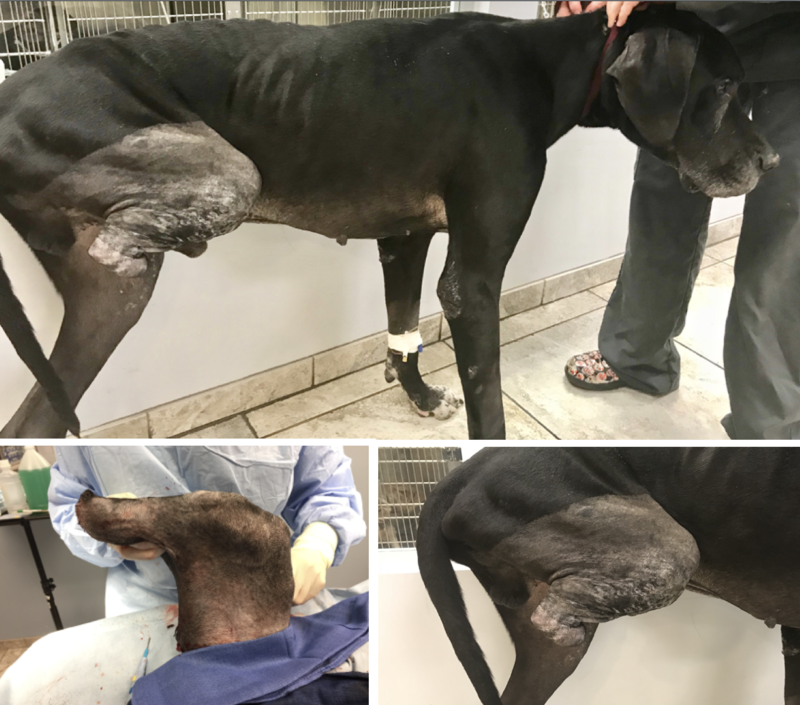 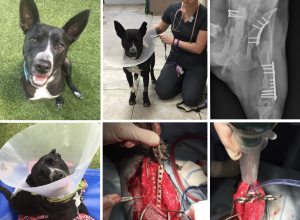 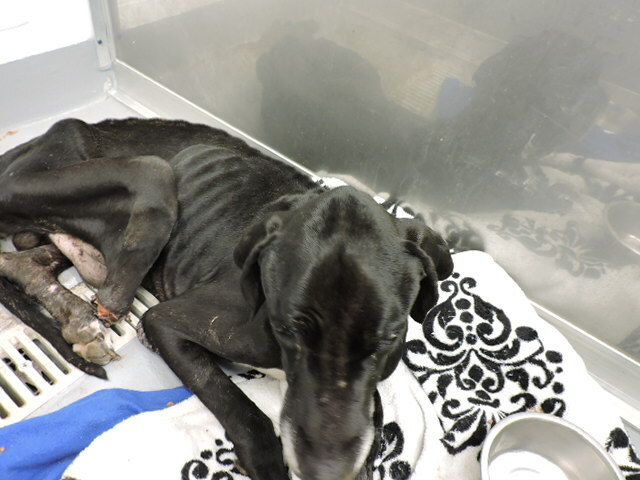 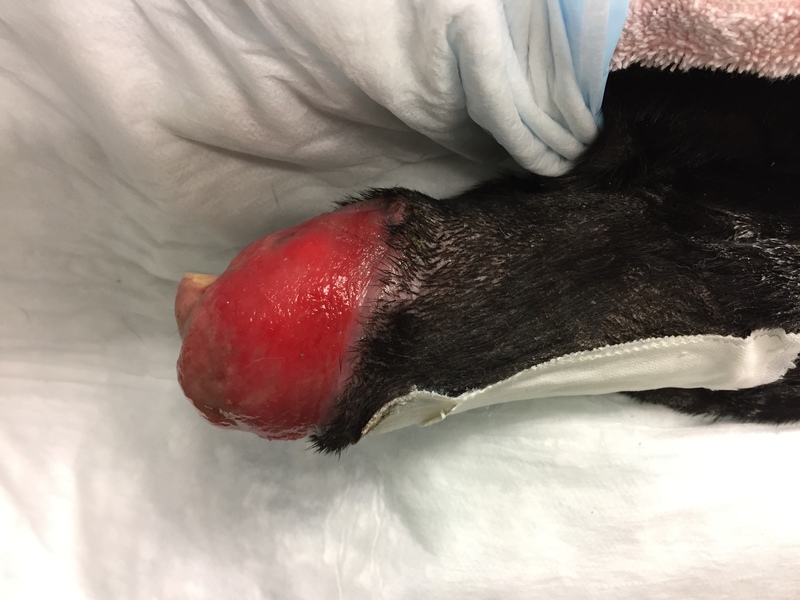 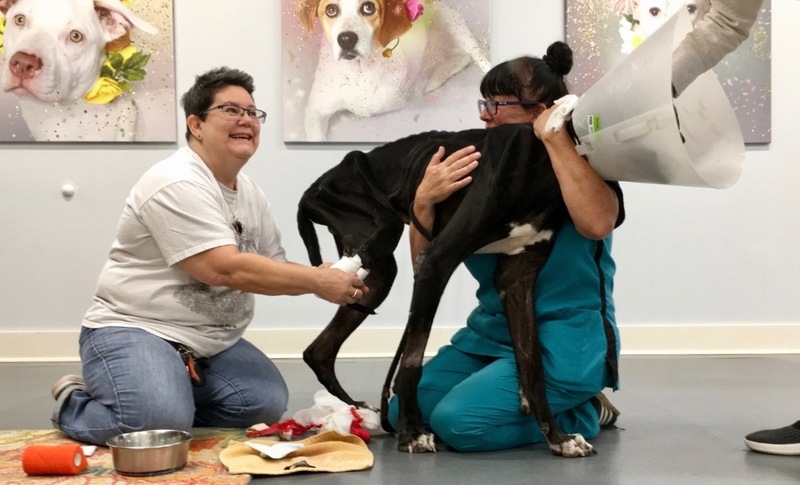 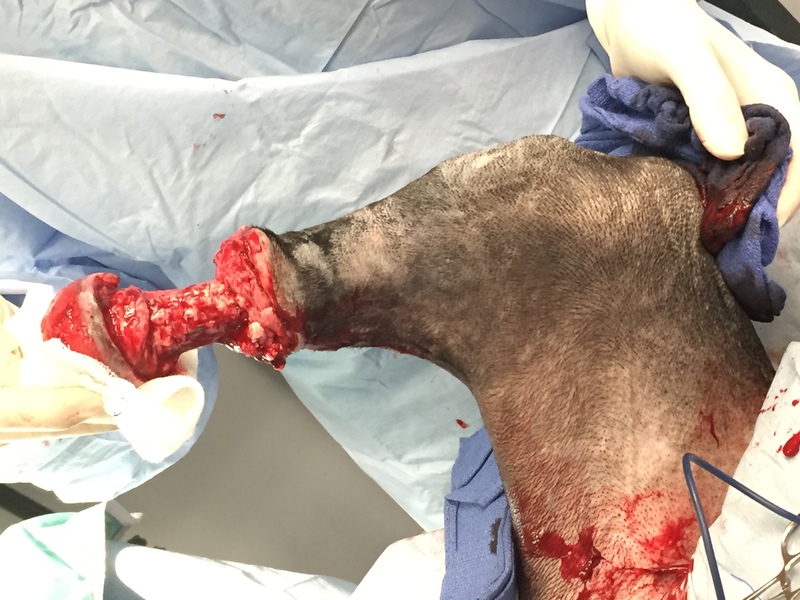 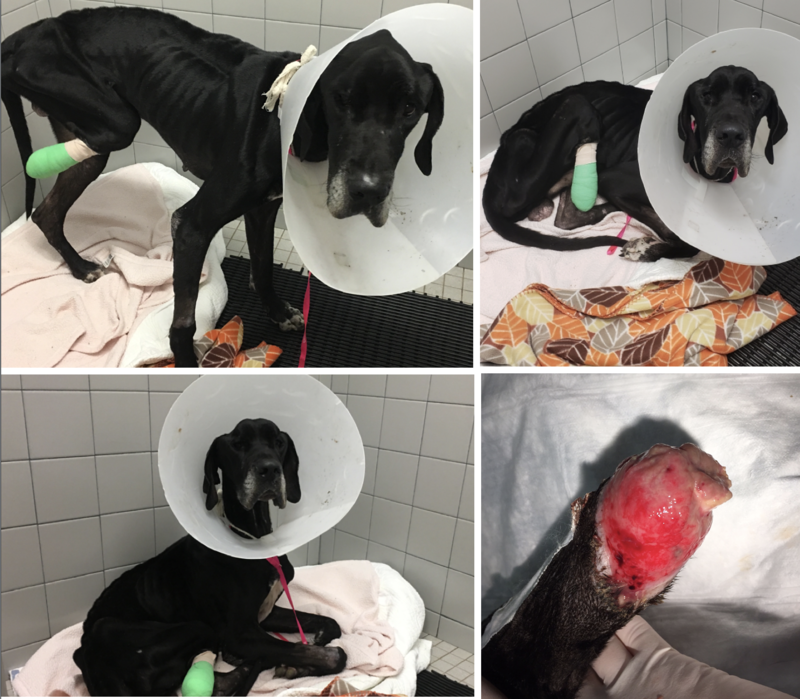 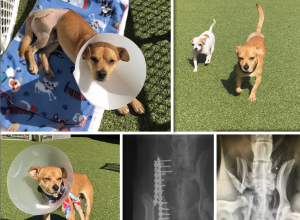 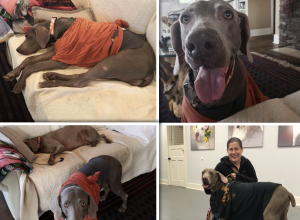 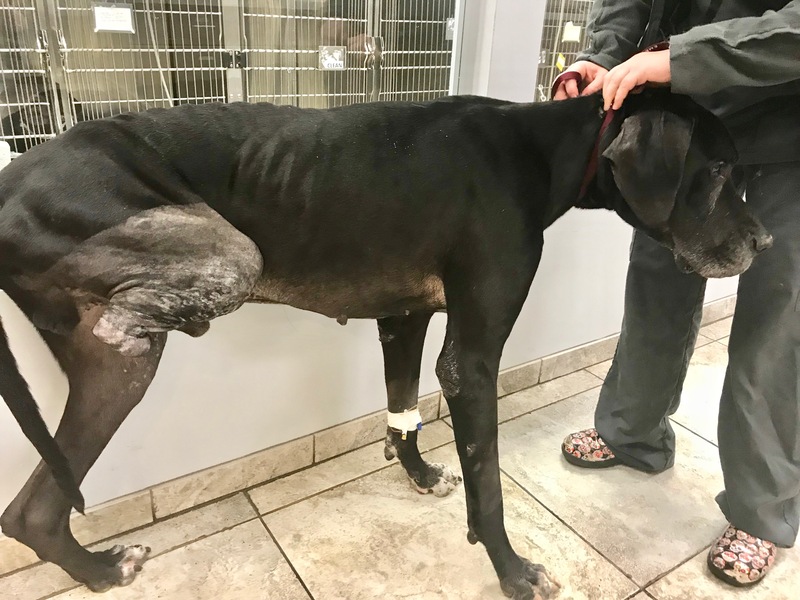 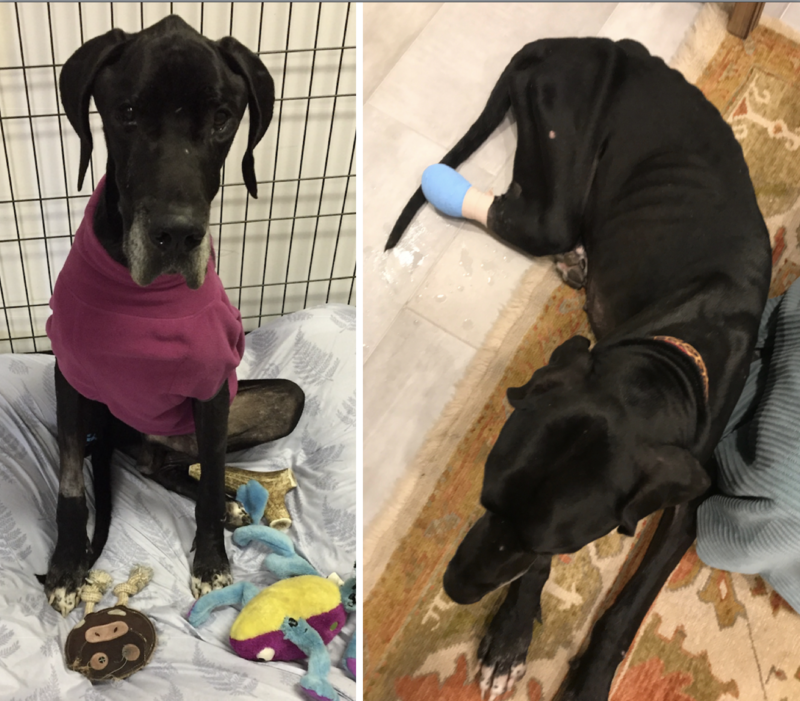 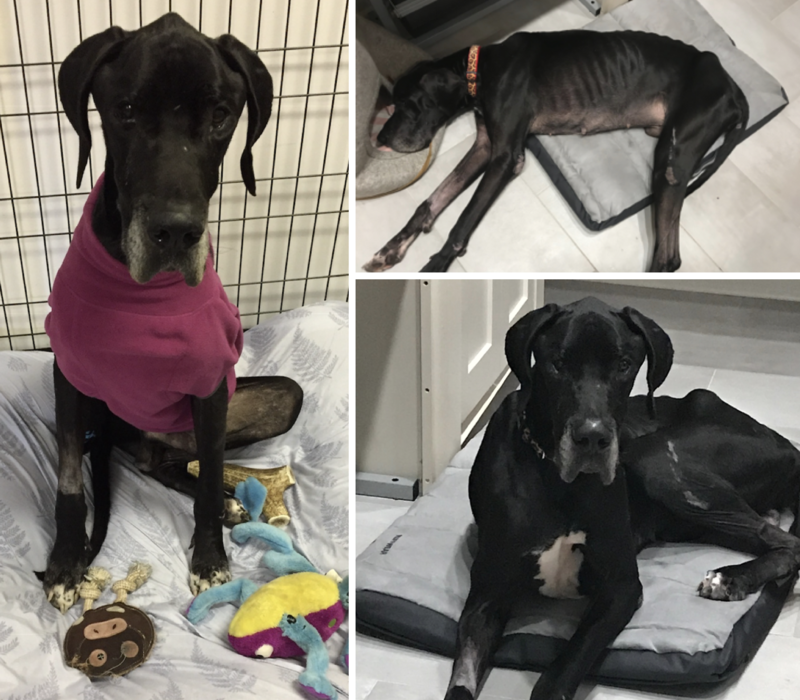 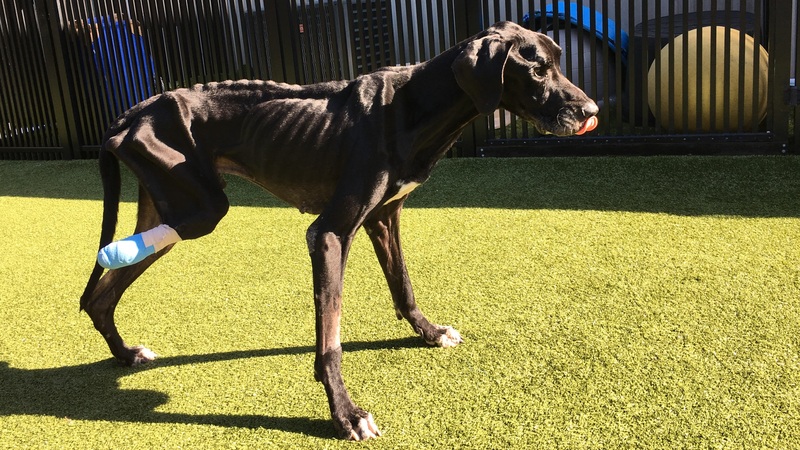 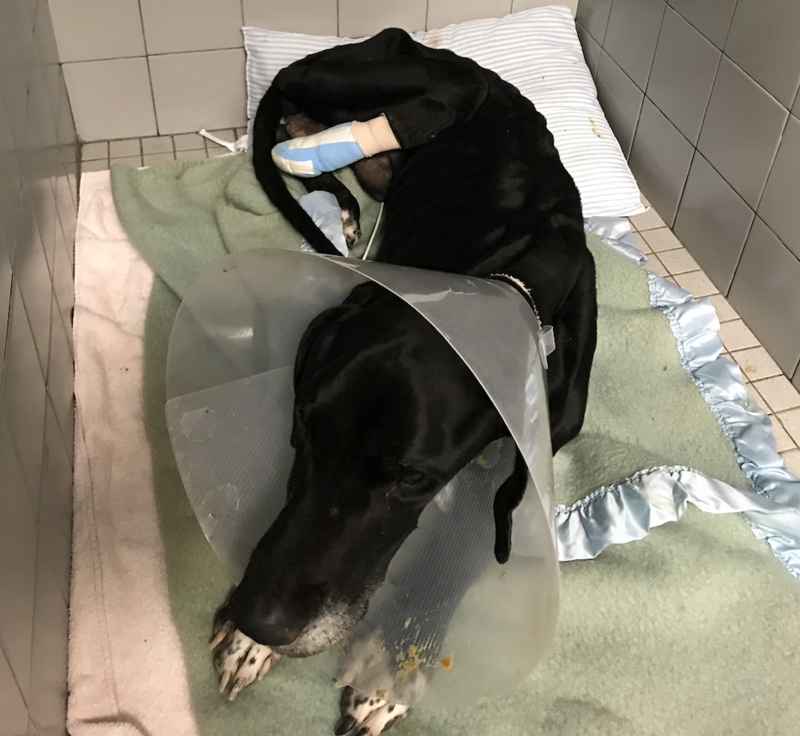 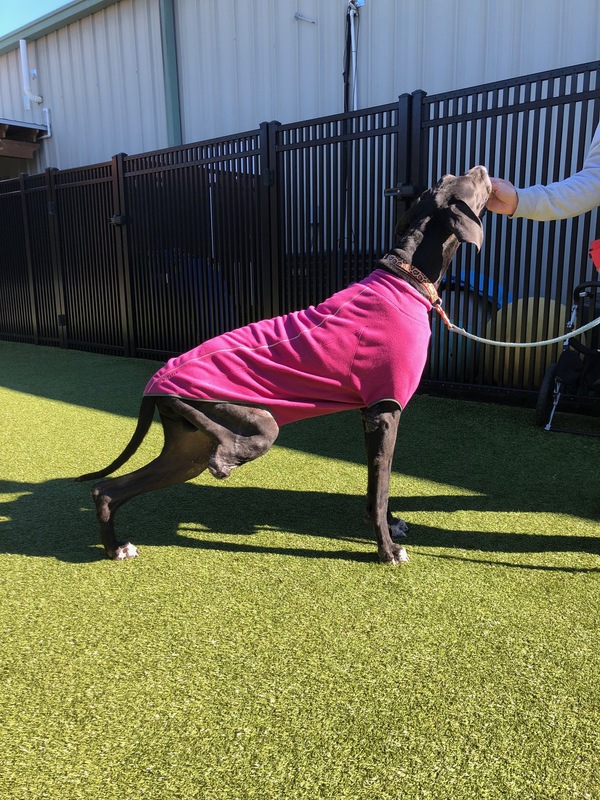 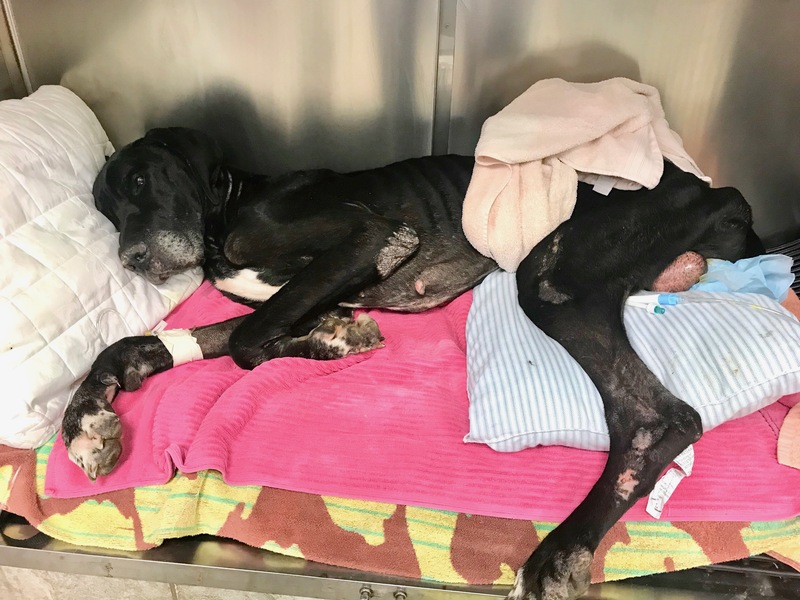 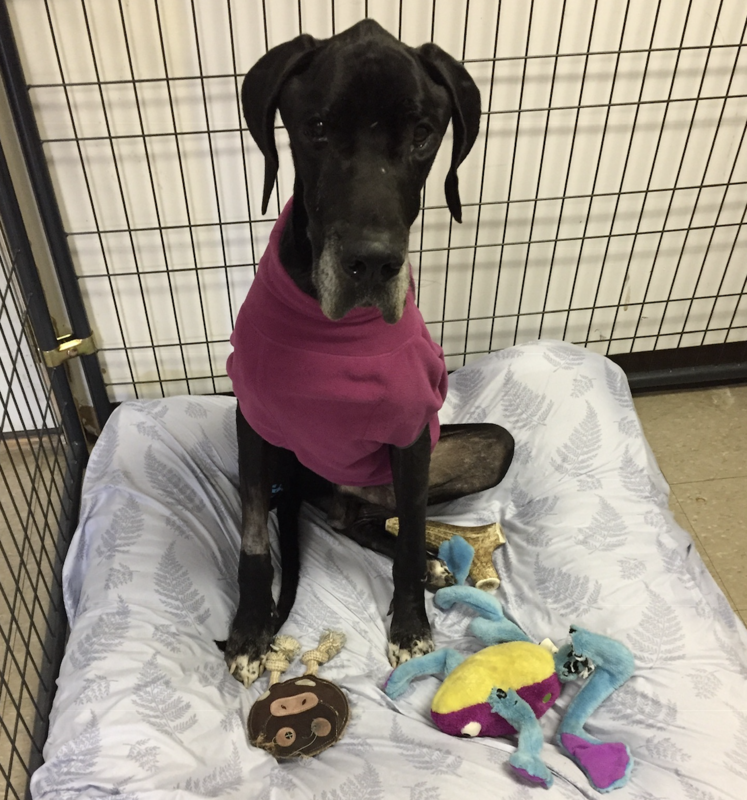 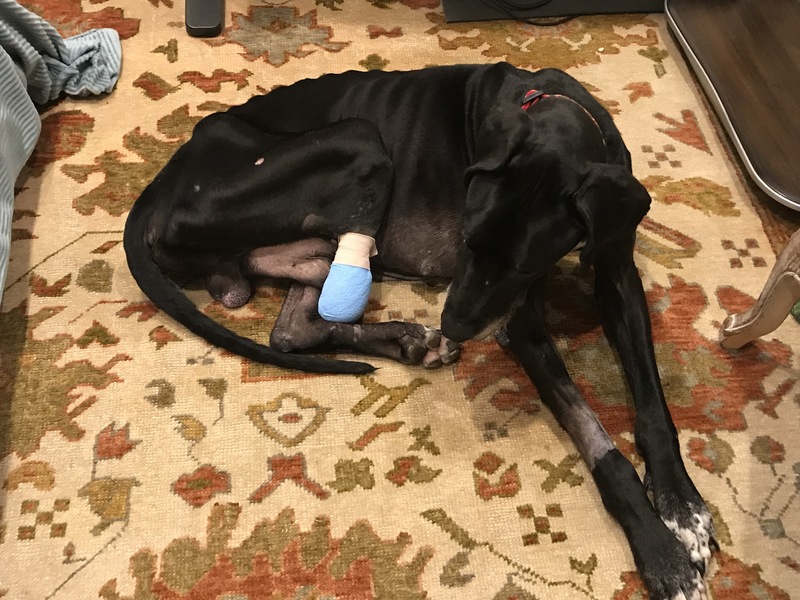 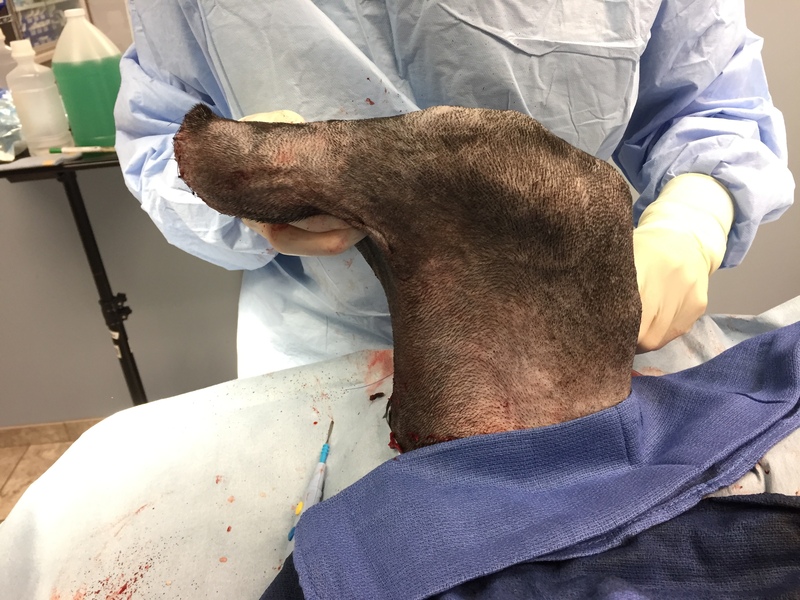 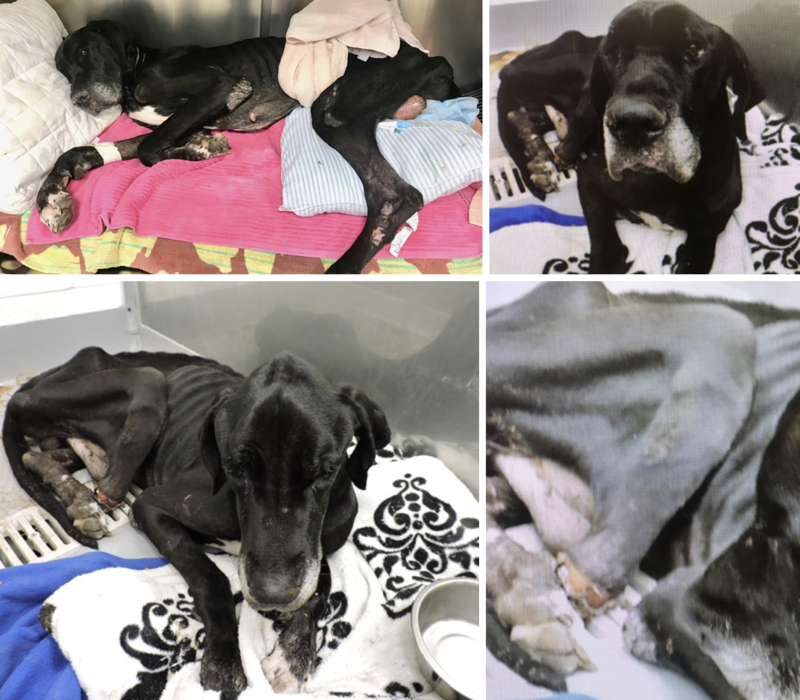 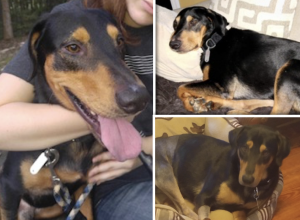 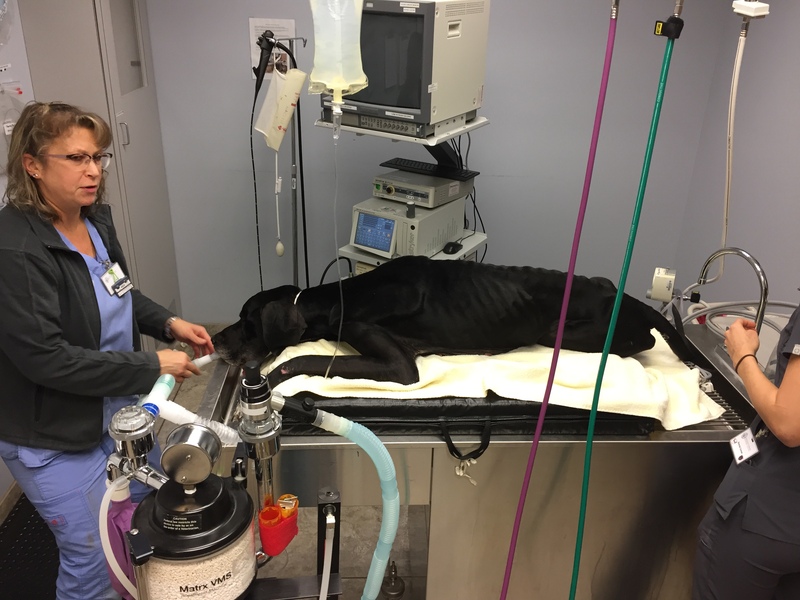 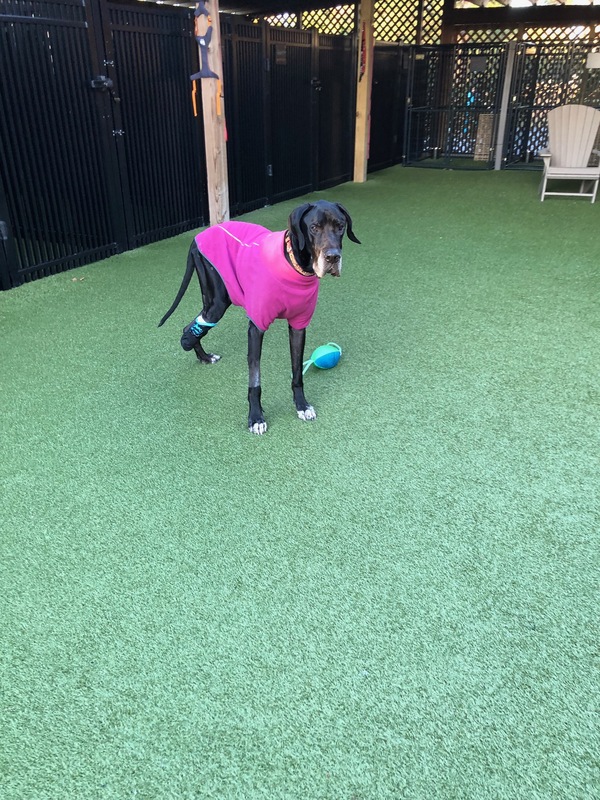 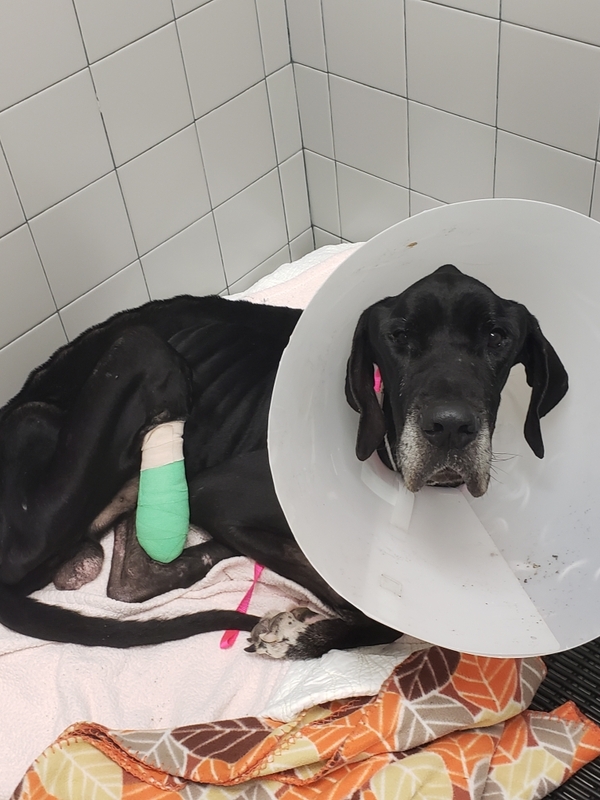 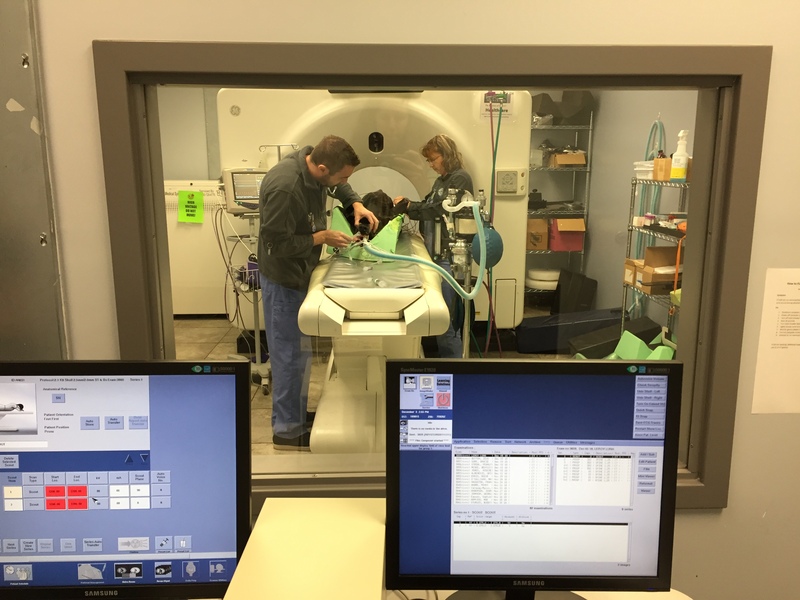 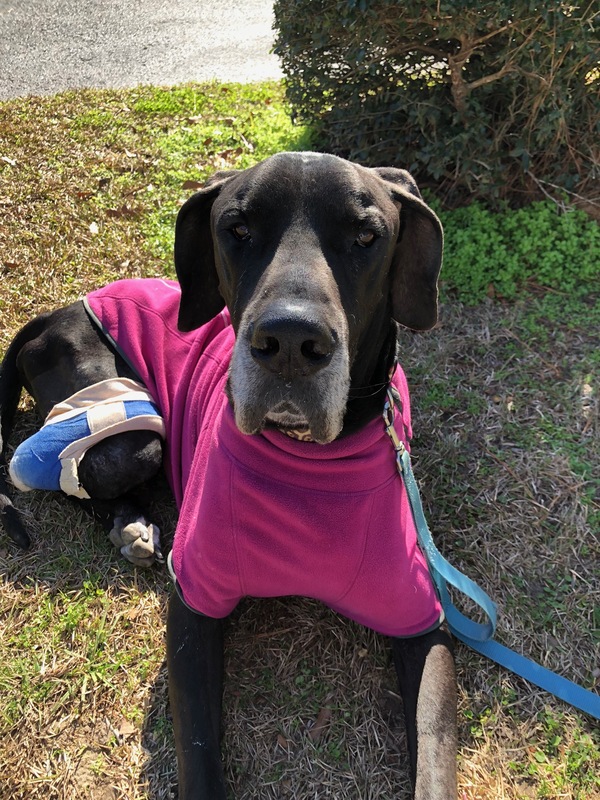 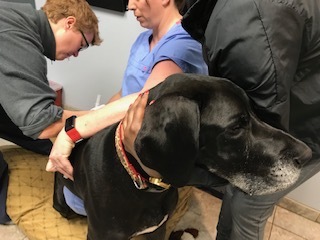 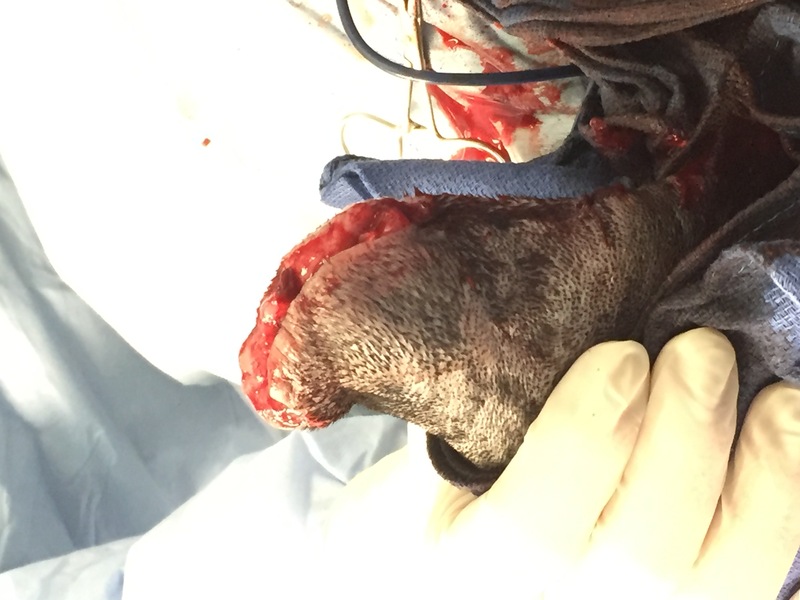 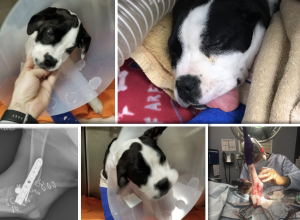 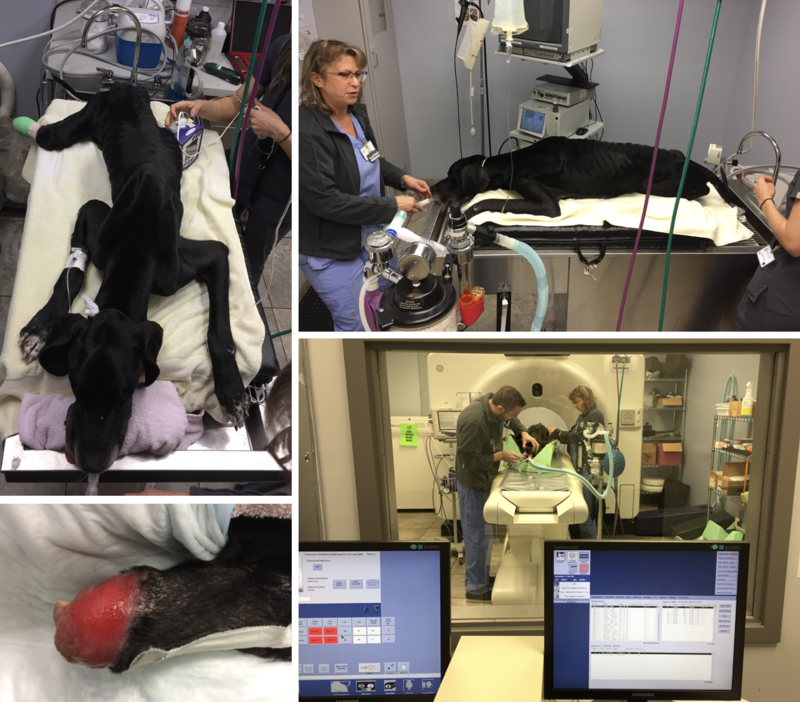 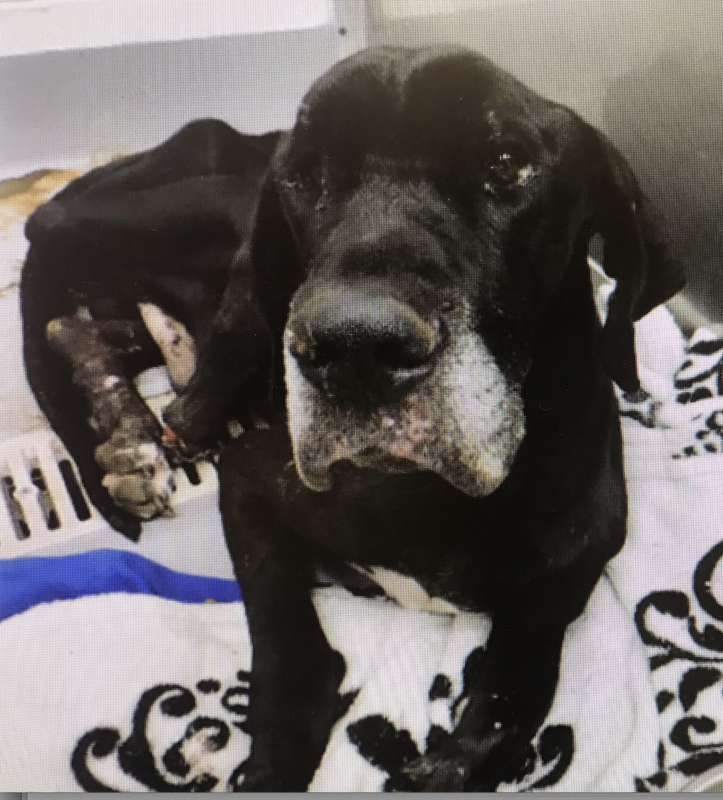 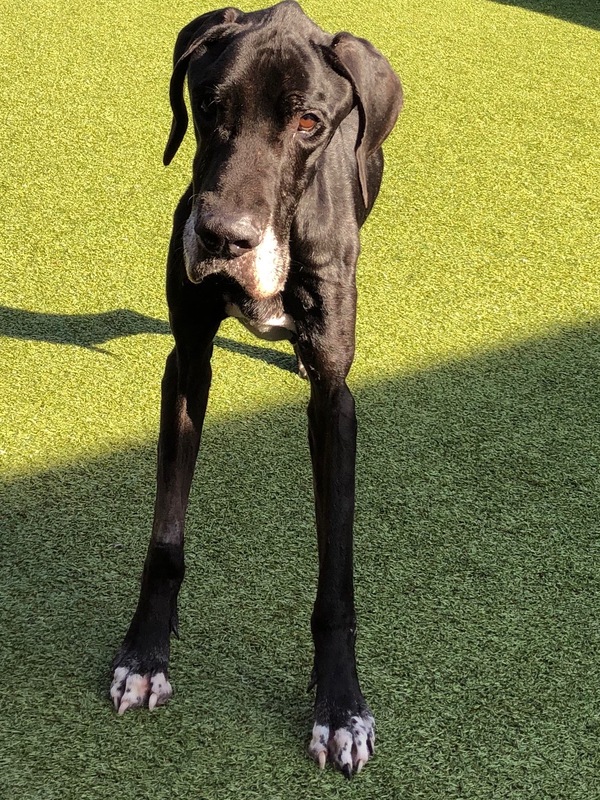 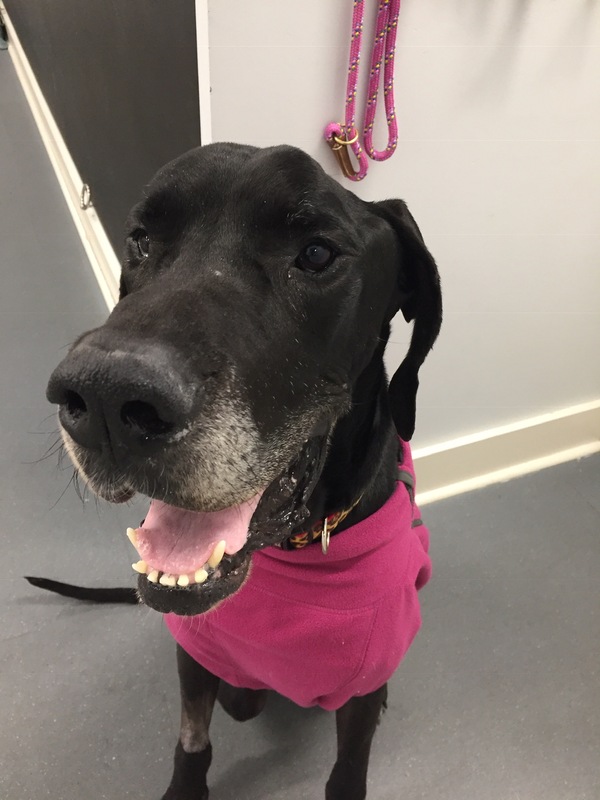 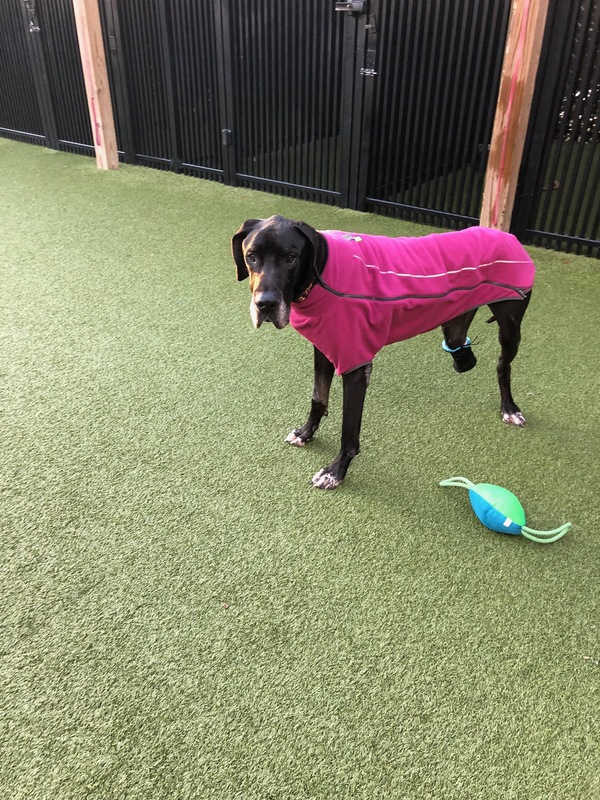 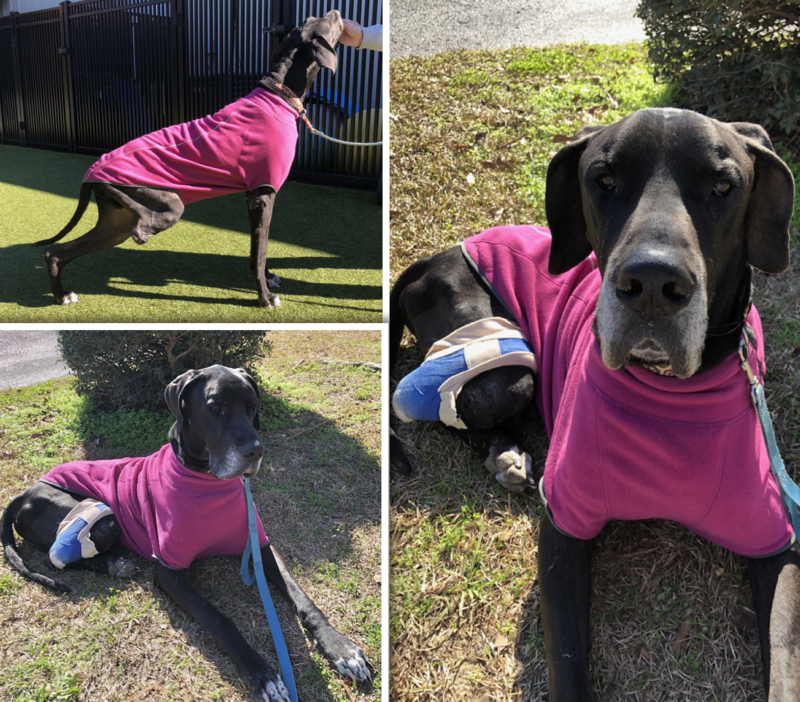 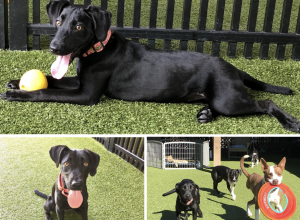 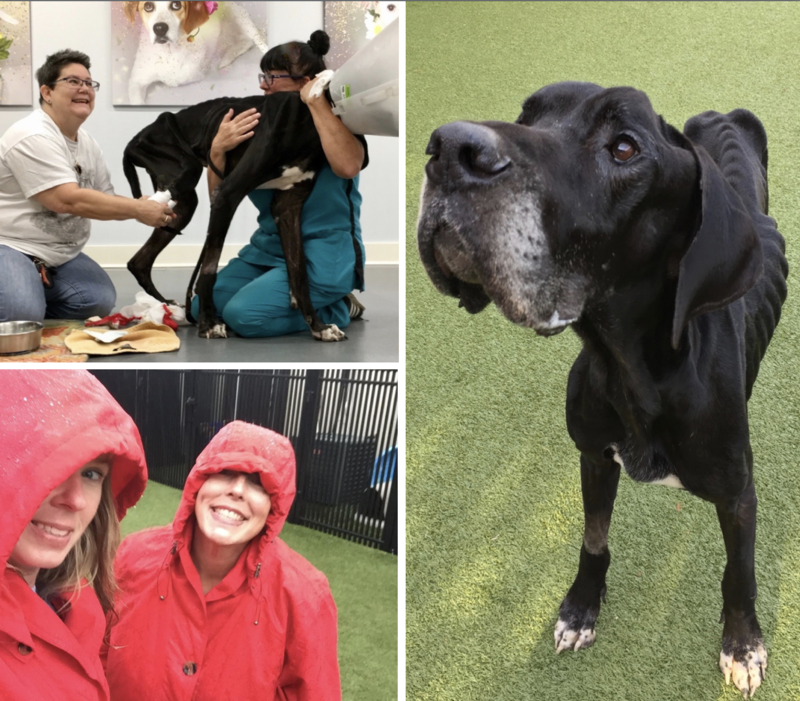 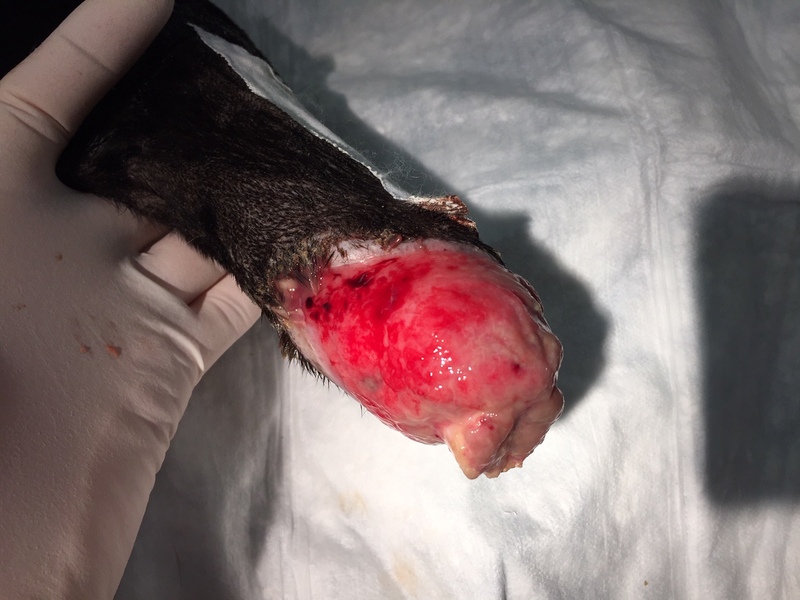 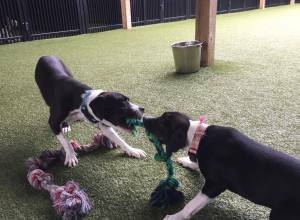 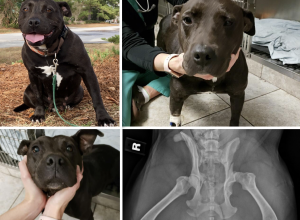 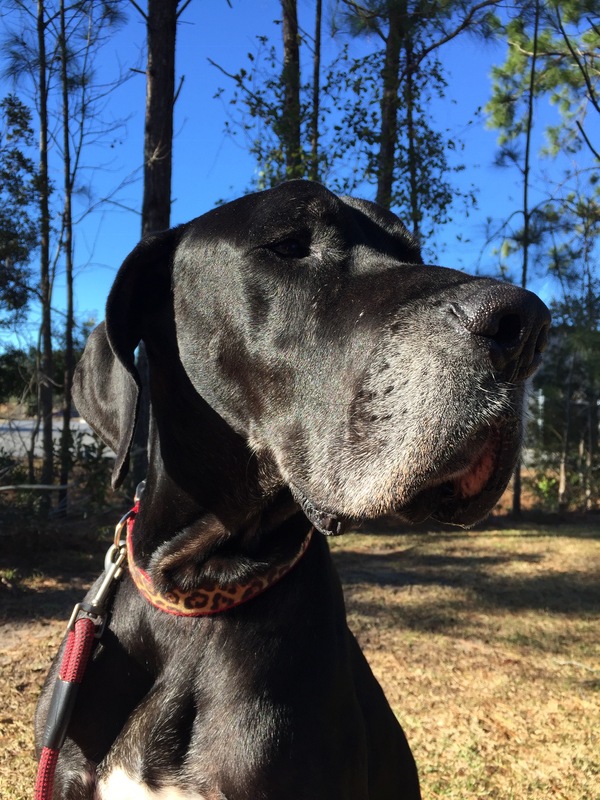 Your donation will help LUKE (Great Dane) recover. 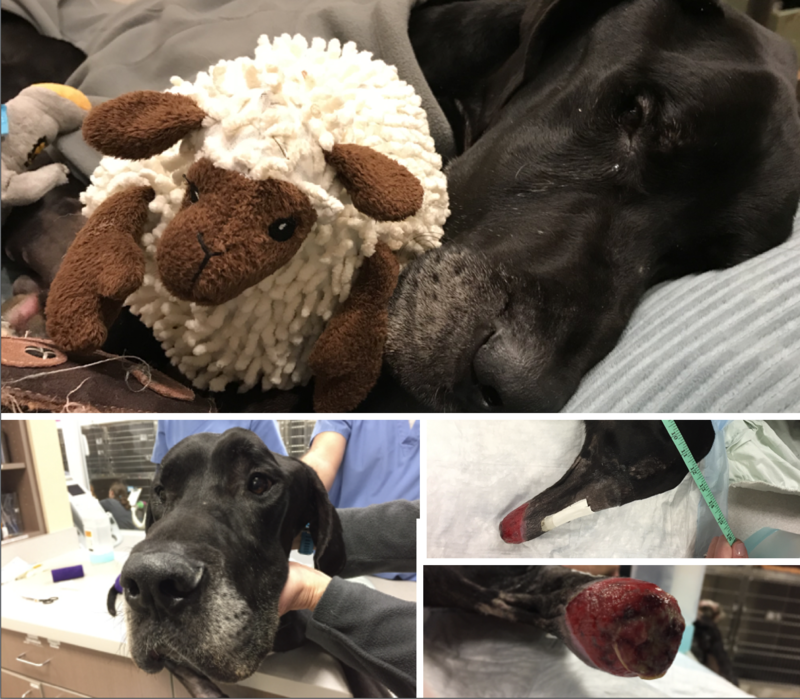 Luke is doing amazing. 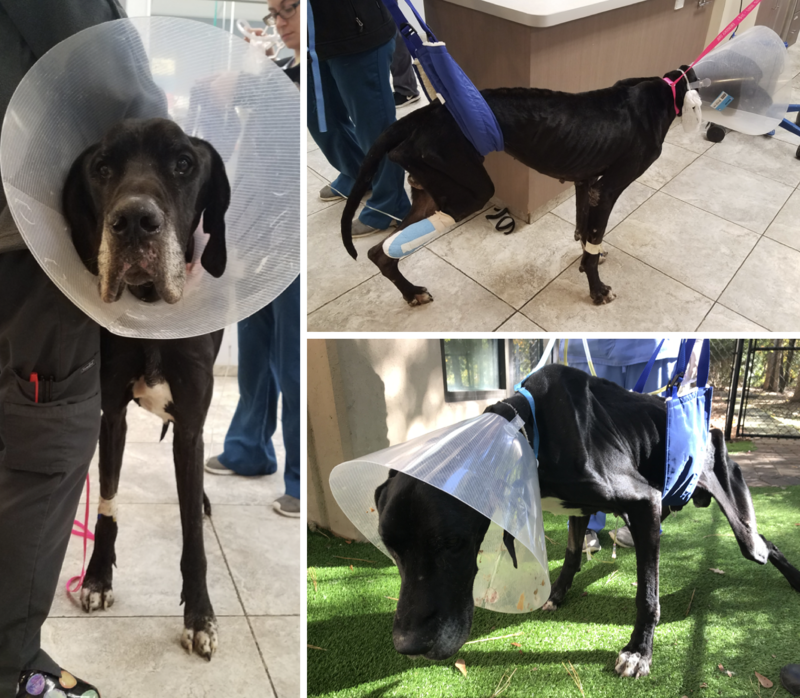 He has gained close to thirty pounds since we first rescued him and is becoming a big Moose. 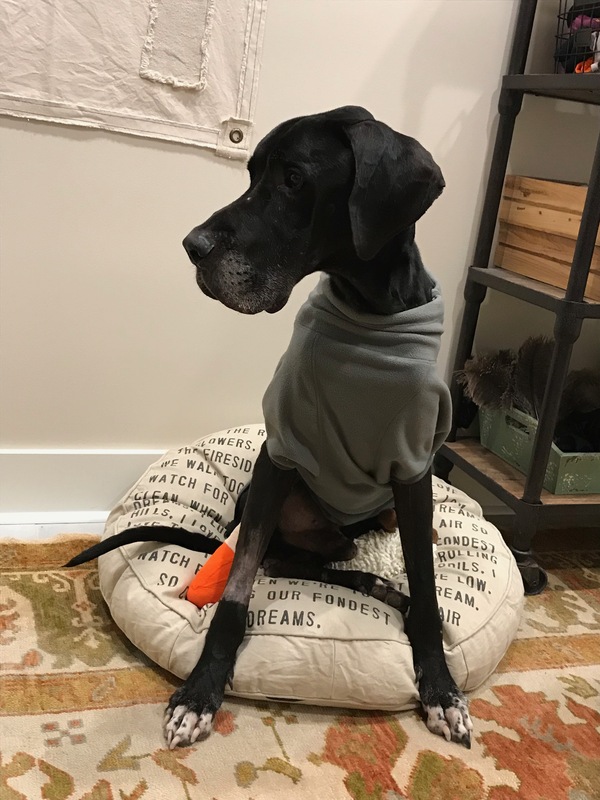 He is still as sweet as can be but is becoming a little bit stubborn. 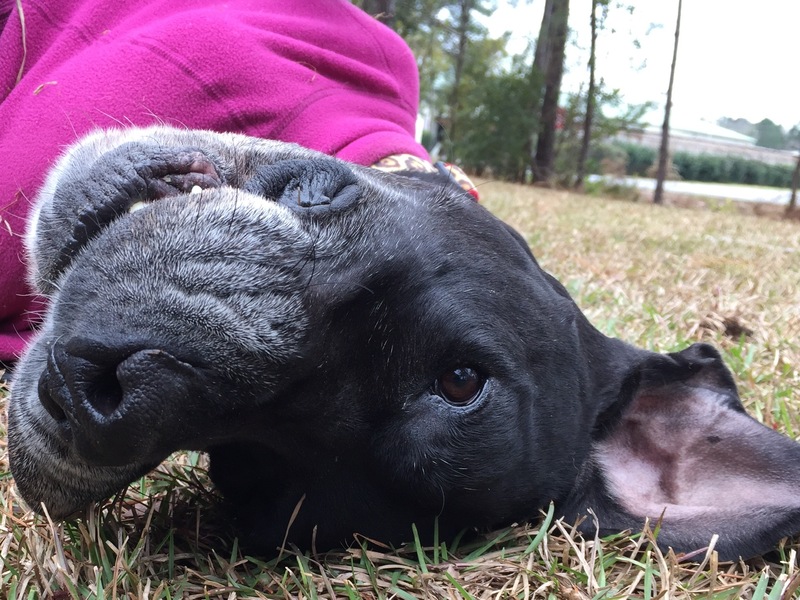 His new little trick is when he does not want to come in, he lays down on his back and is almost impossible to move. 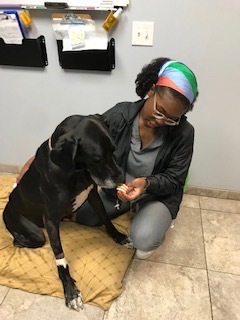 He is very food motivated so offering him a tasty treat usually does the trick. 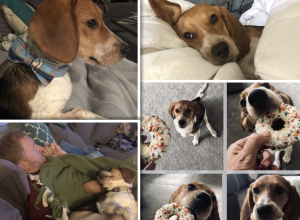 When Luke first arrived, all he cared about was food, food food. 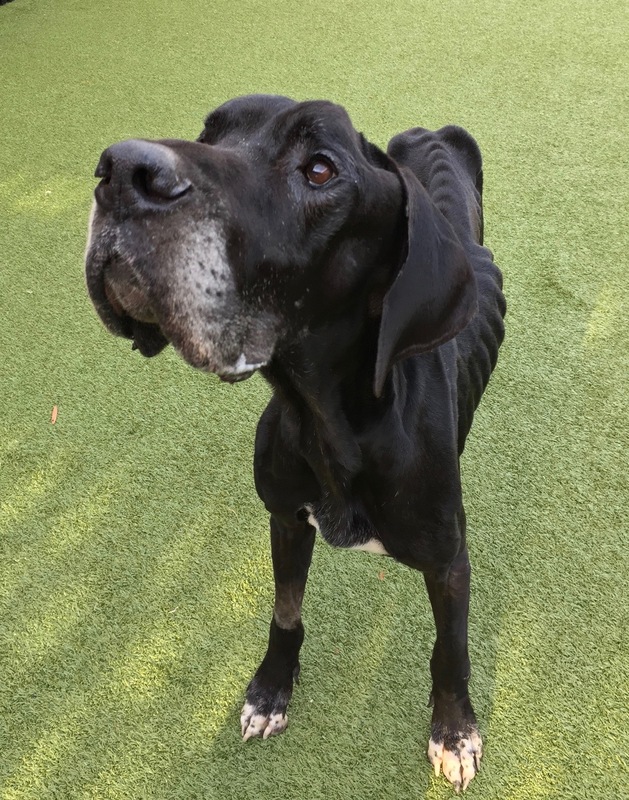 It did not matter how much food we put out; he would consume it all and want more. 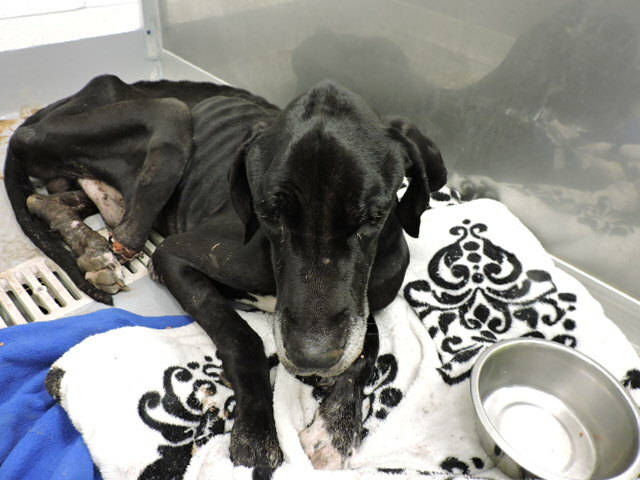 We have now cut back on his feedings since he is not able to eat all of his food which is a very encouraging sign. 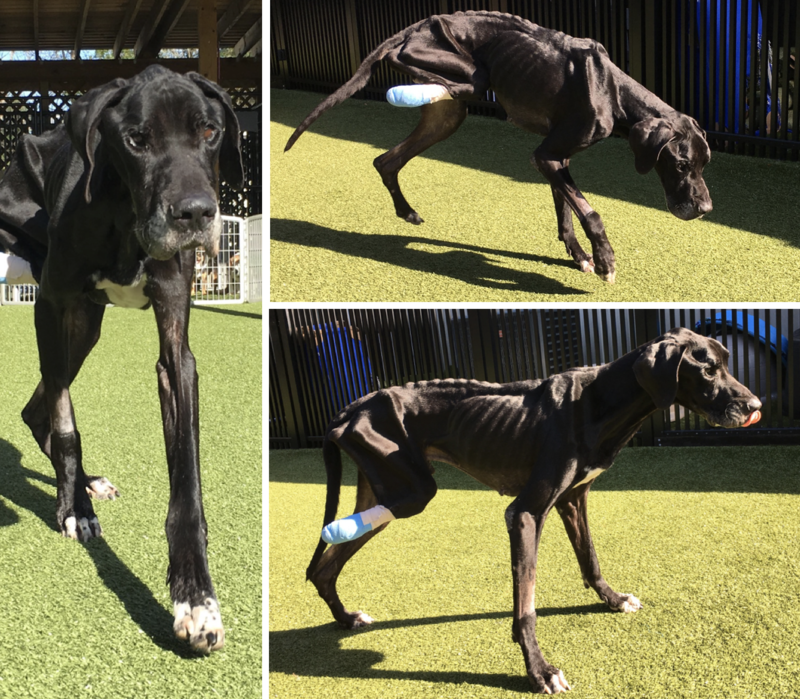 Our special boy has finally begun to catch up and is no longer starved or emaciated. 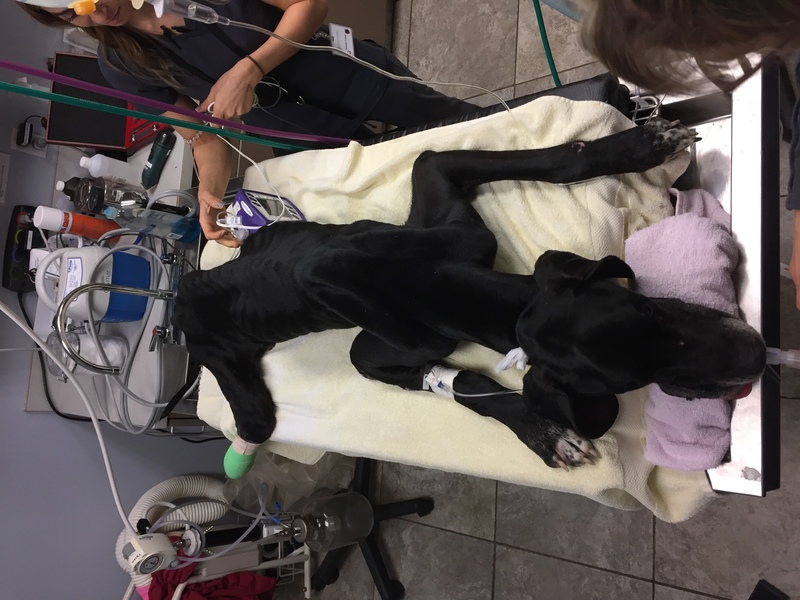 He feels great, and all of his vitals are stable. 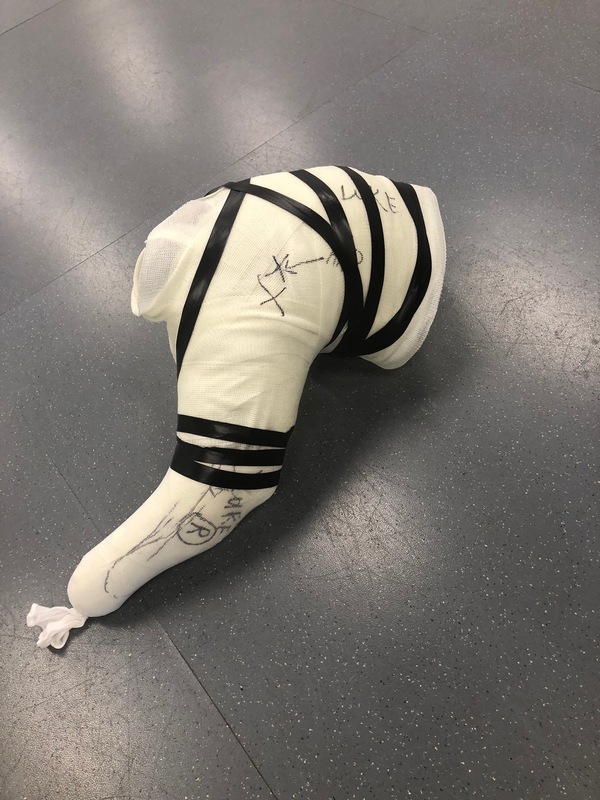 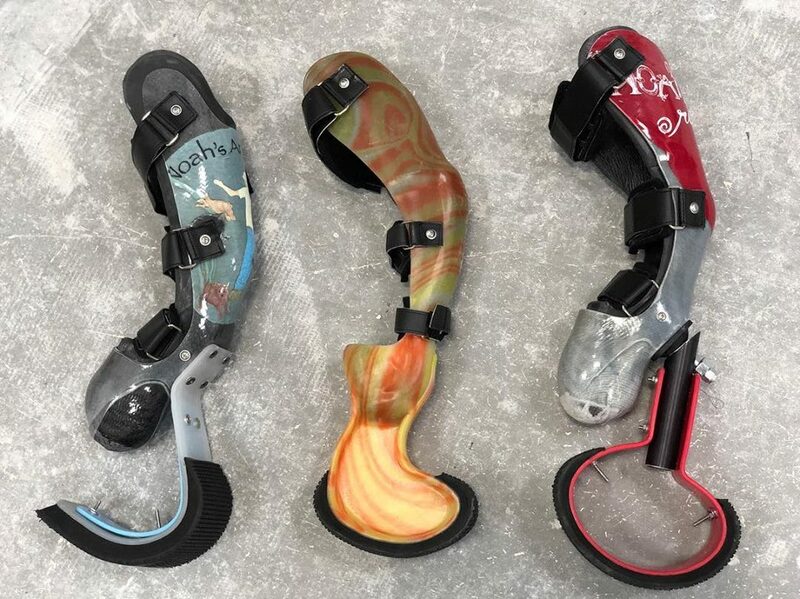 We have the Prosthetic Specialist flying down in the next couple of weeks to fit Luke for his new leg. 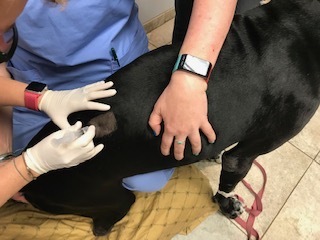 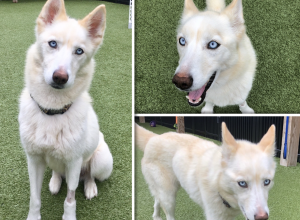 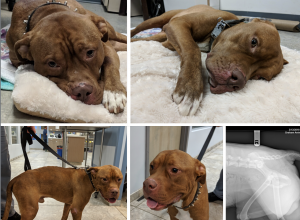 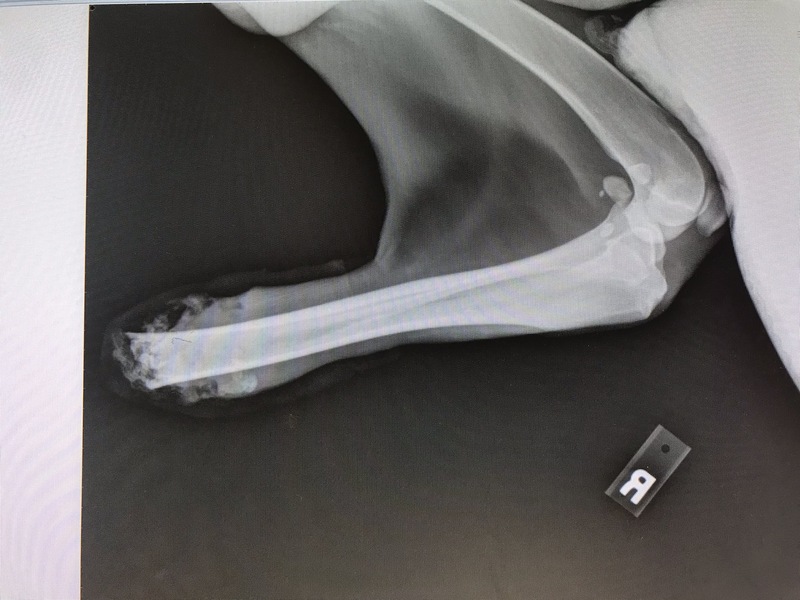 The good news is since we have finally gotten rid of the infection he had, we are no longer considering amputating his leg. 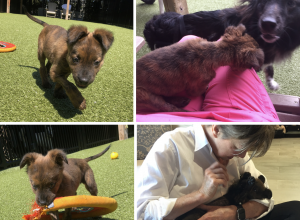 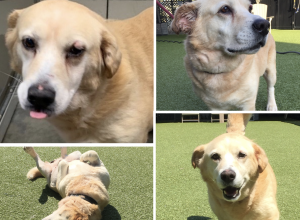 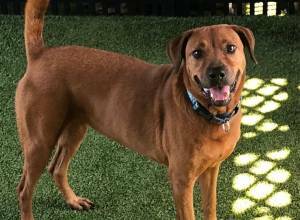 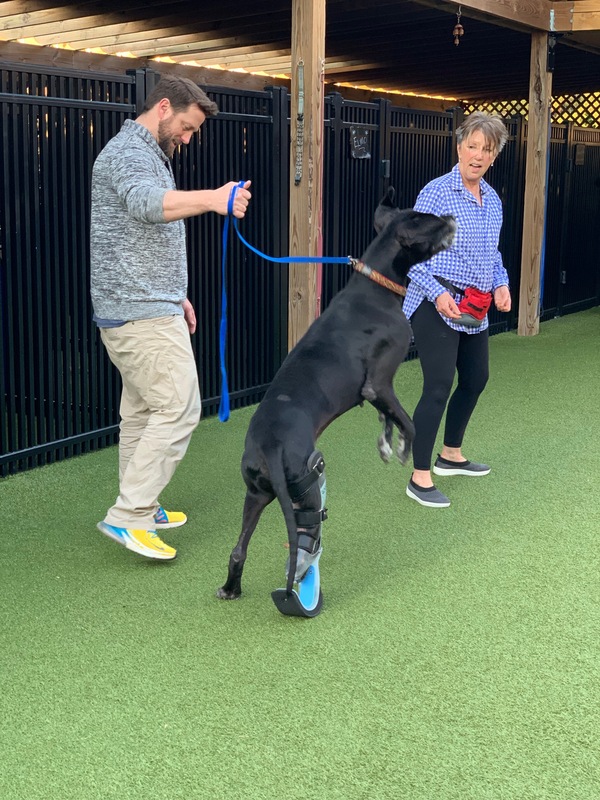 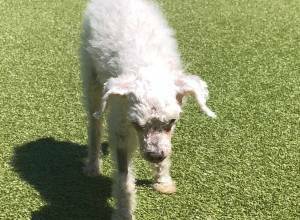 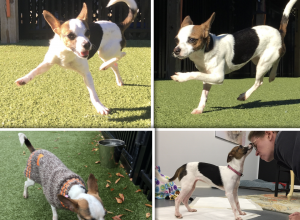 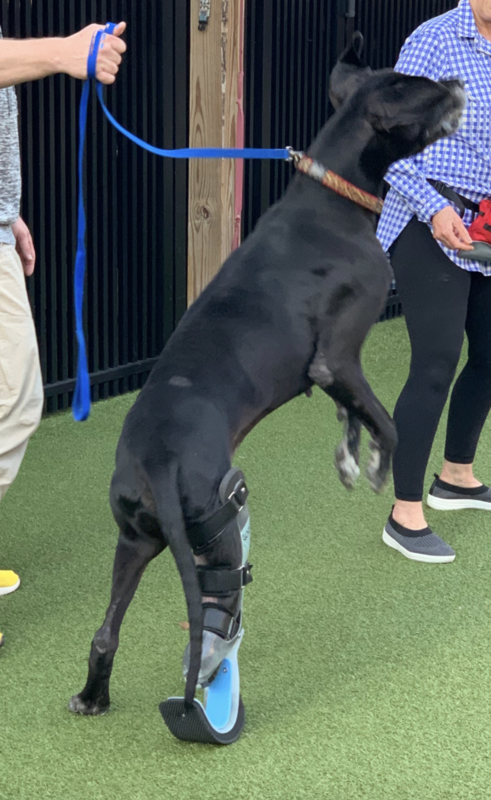 Luke has built up enough strength in his remaining rear leg that he can now run across our yards which is Miraculous given his size. 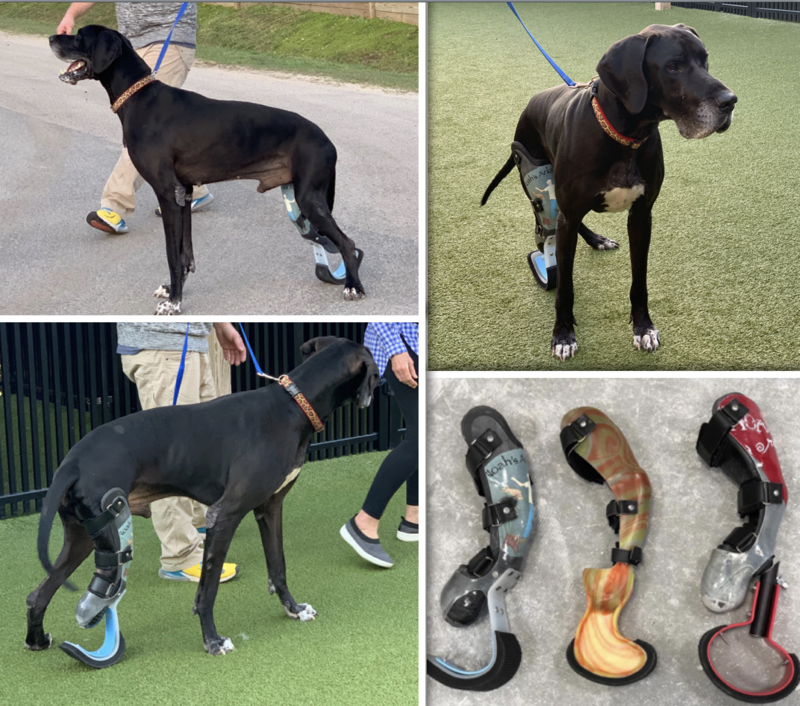 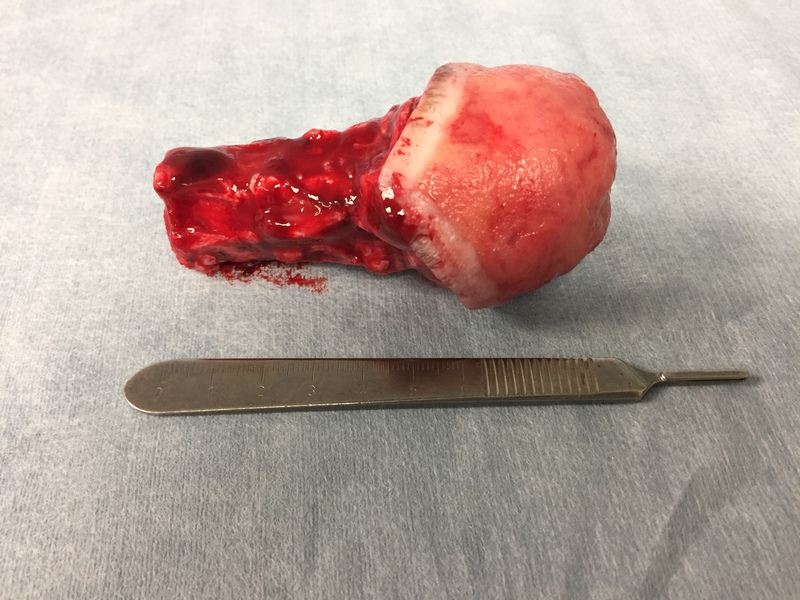 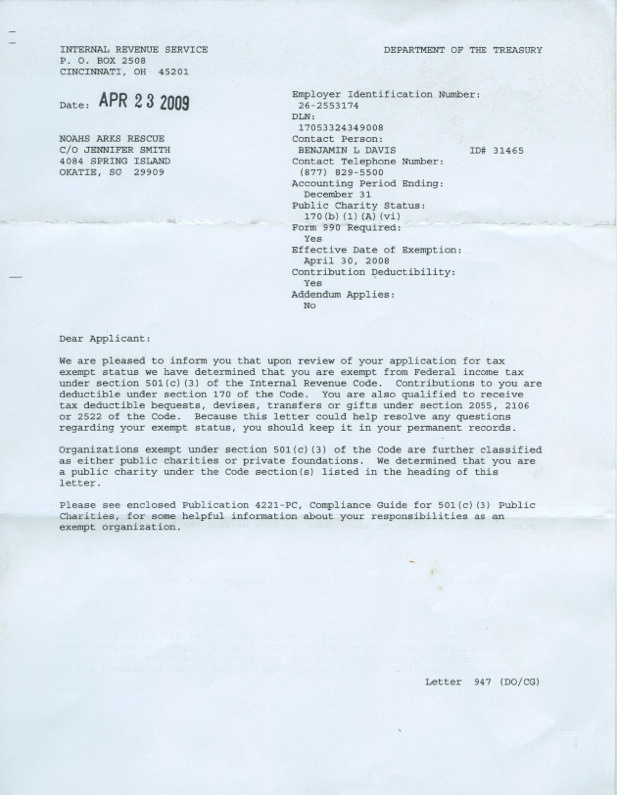 We are very hopeful Derrick Campana can make a prosthetic that will work for him. 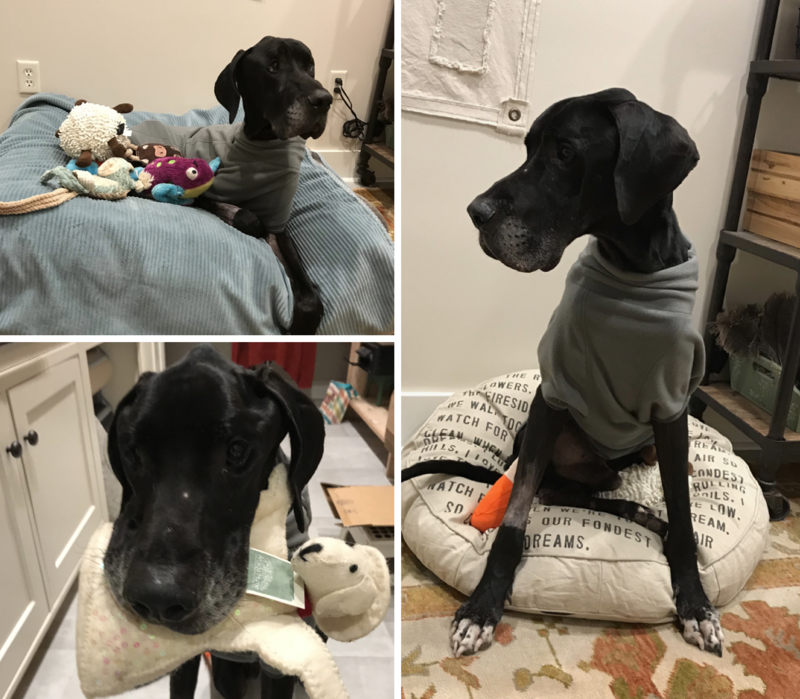 Luke is still the sweetest boy that loves everyone. 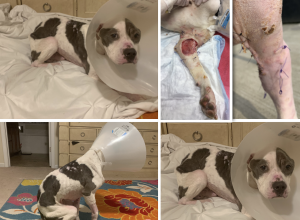 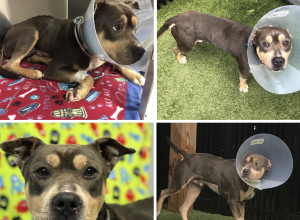 He did great from his neuter which should have slowed him down a little. 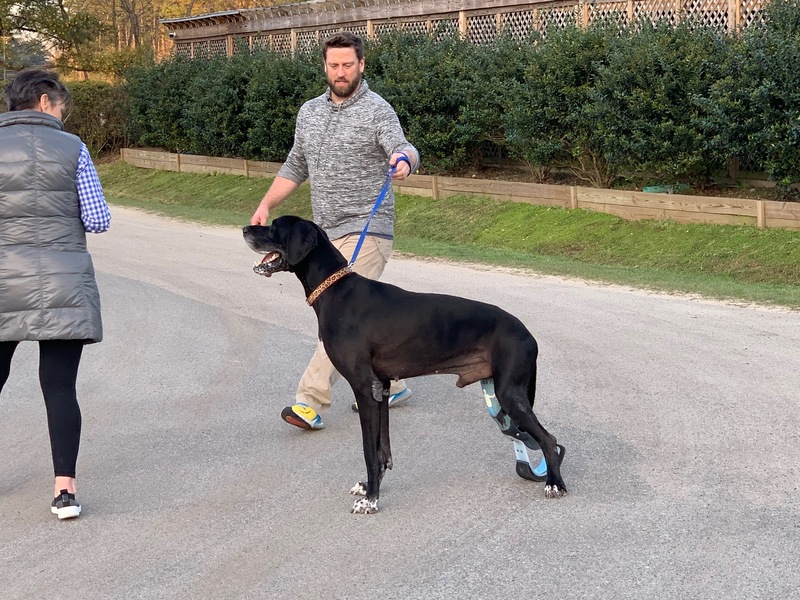 We now have to watch him when he is in Fetch Mkt because he is like a bull in a china shop. 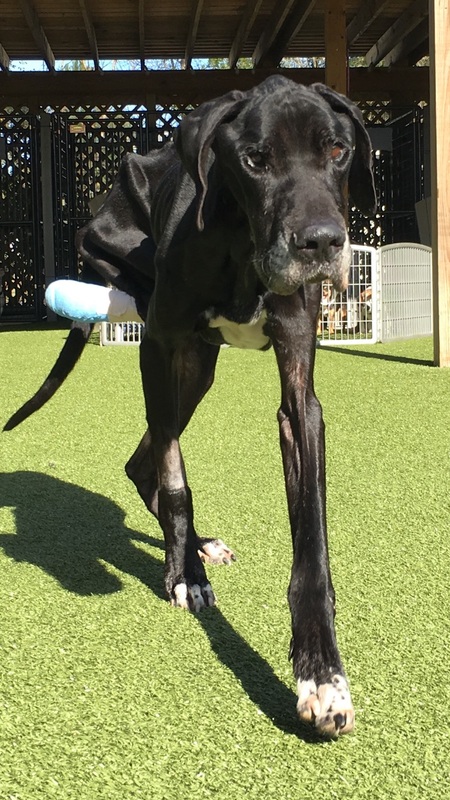 It is effortless for him to break things because of his size. 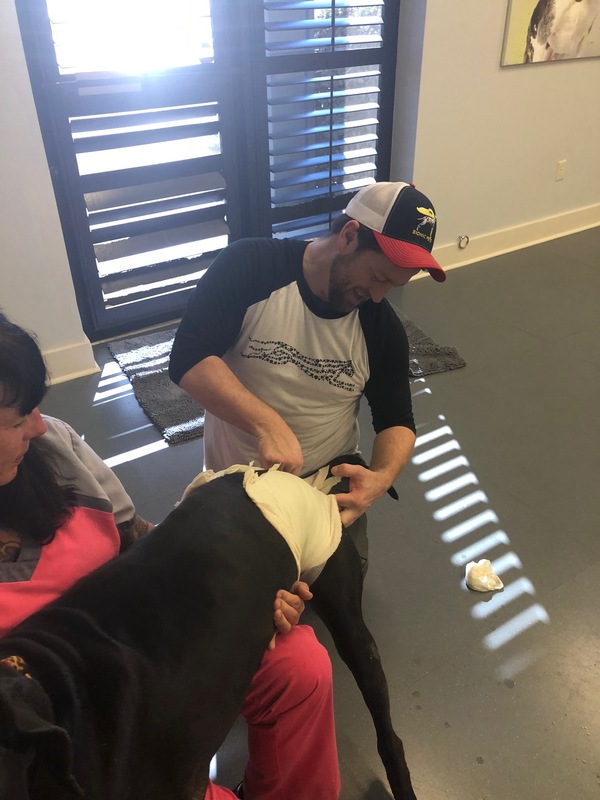 He acts like a huge baby that wants to be in your lap all the time. 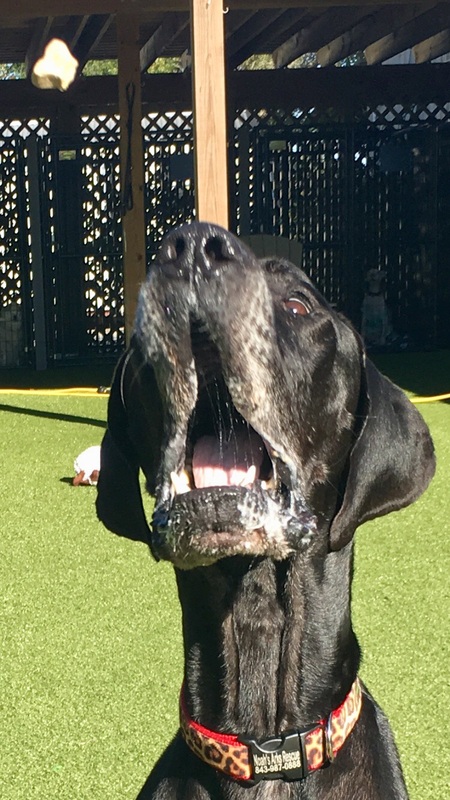 Luke loves having a stuffed animal in his mouth. 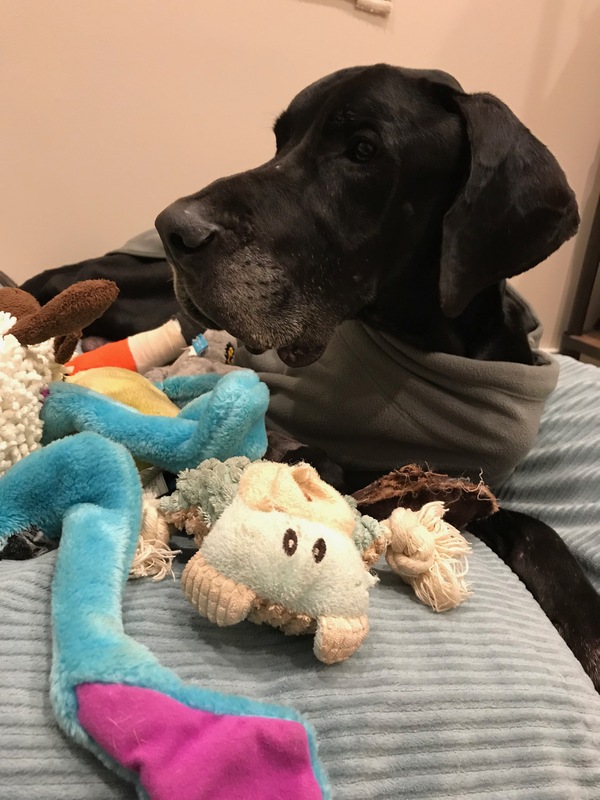 The minute the door opens to the shop, he runs across and grabs as many kids stuffed toys as he can fit in his mouth. 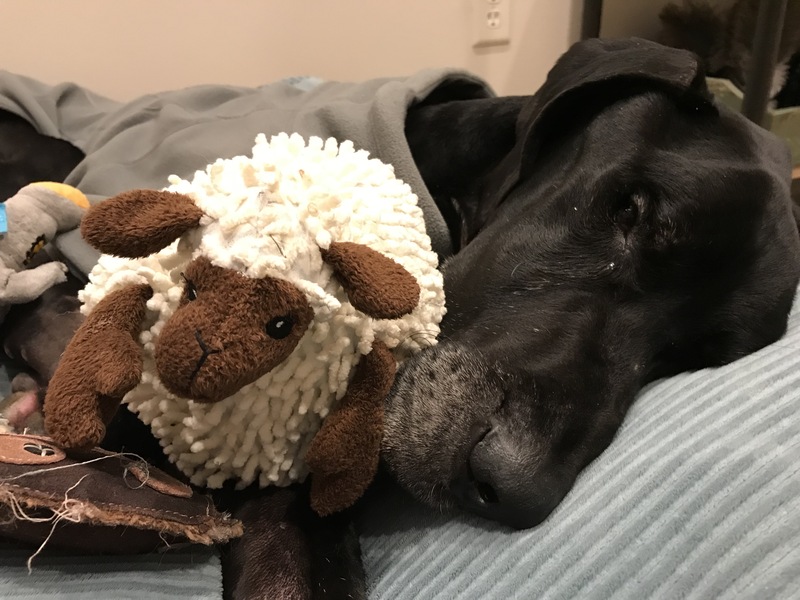 Once he has them, they are done for. 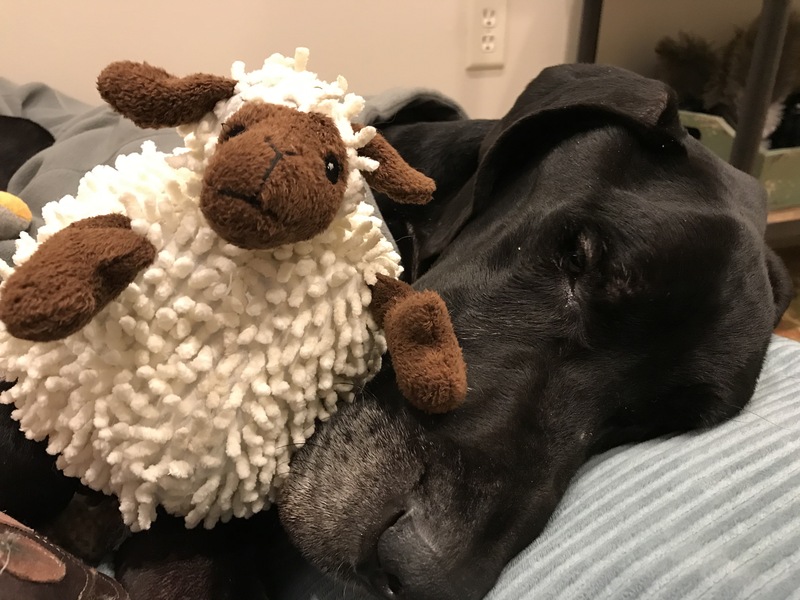 He is not going to give them back until they are all mangled. 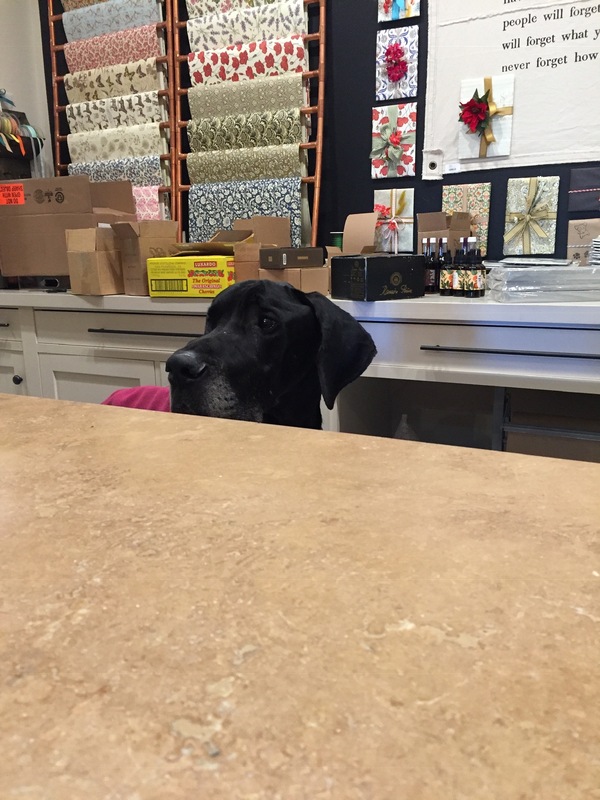 We are now keeping him out of the front of the store. 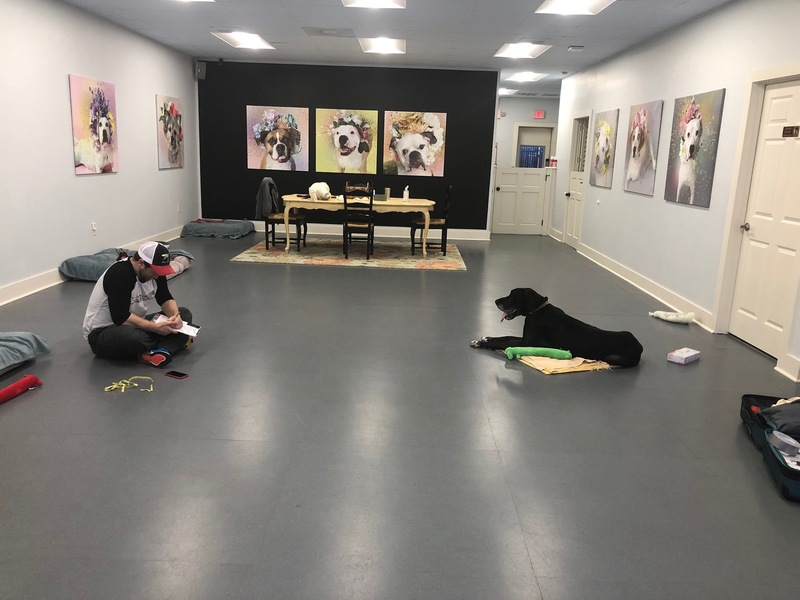 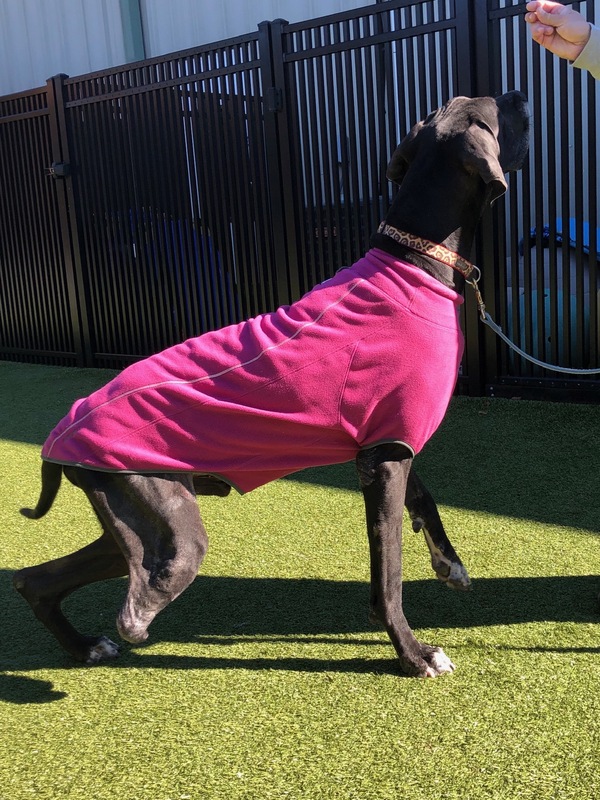 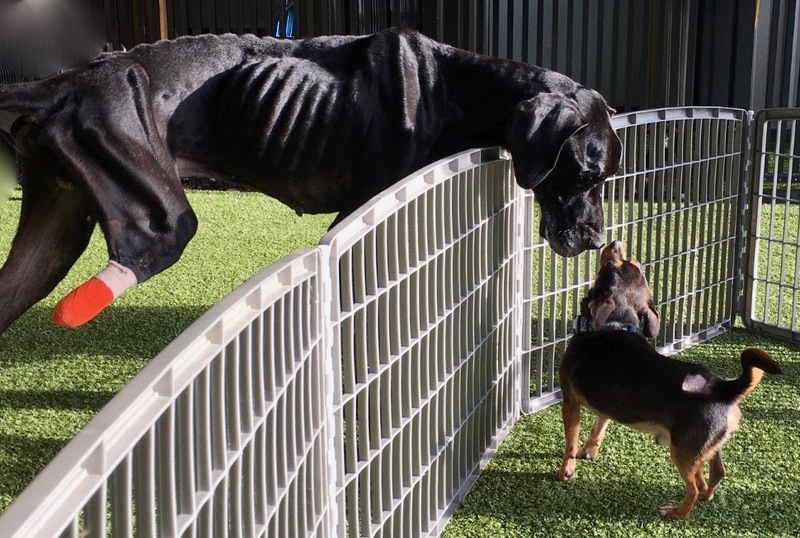 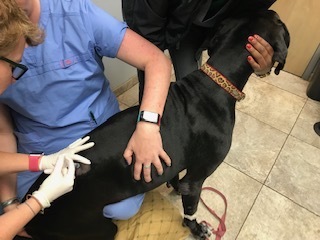 I have not been around a Great Dane this size in a very long time and let me tell you, I am shocked by the things he can reach because of his height. 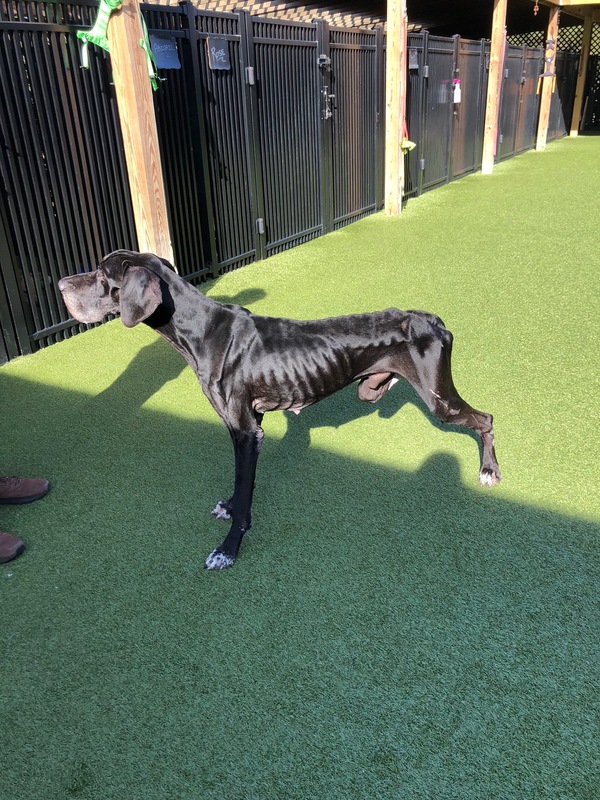 We are delighted with the progress Luke has made. 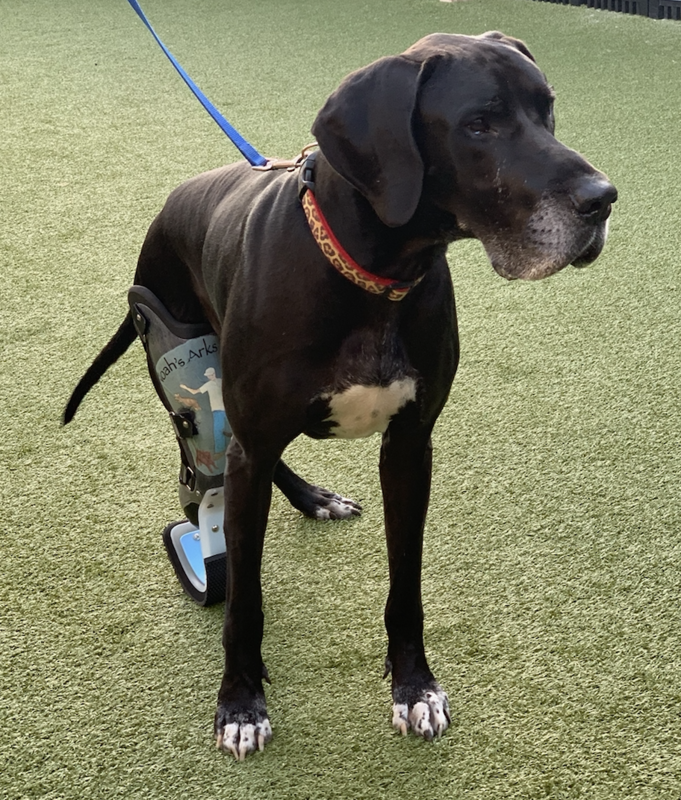 He is getting close to the finish line where he can get his new prosthetic and be adopted into a great Family. 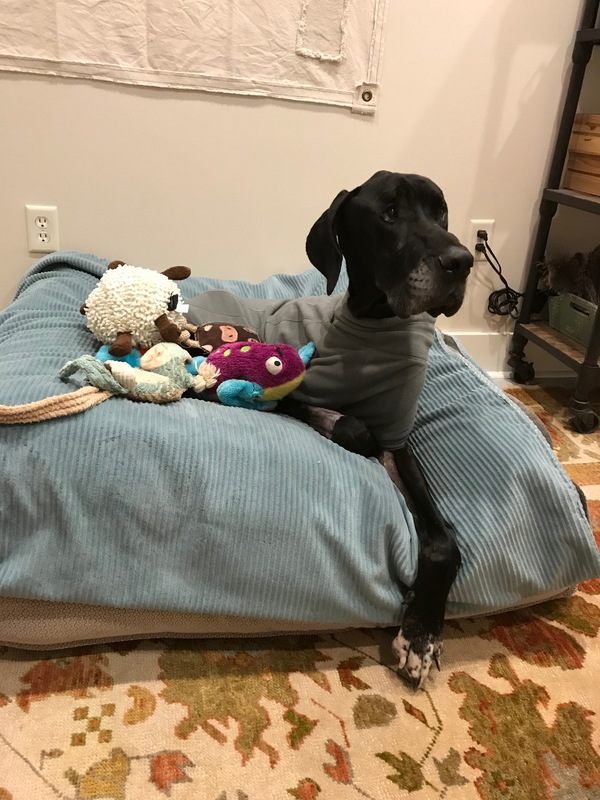 Life is good in Luke's World because of your continued Love and Support. 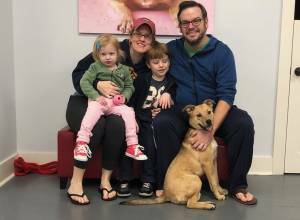 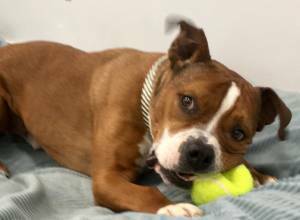 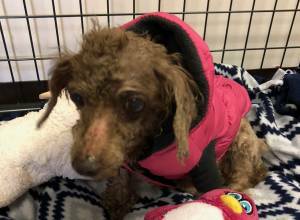 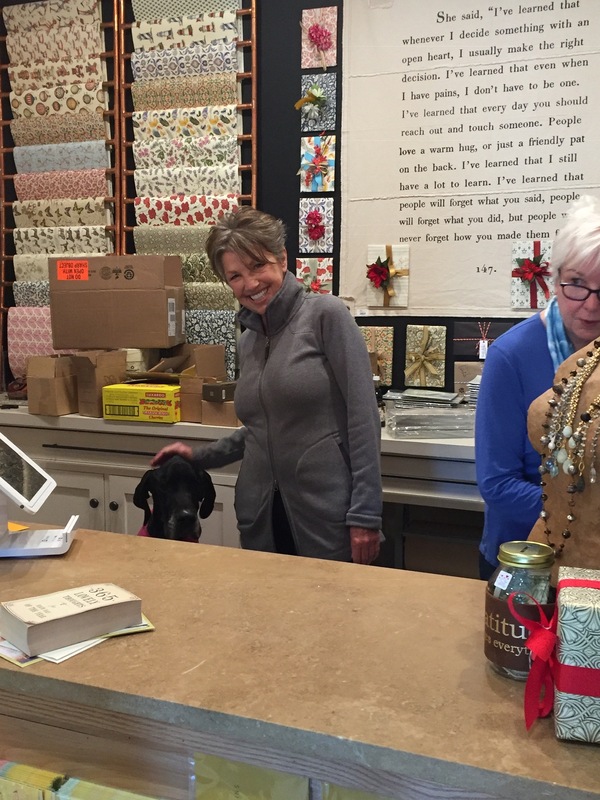 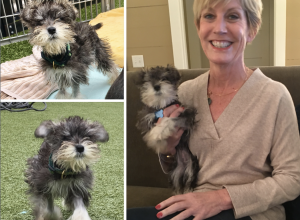 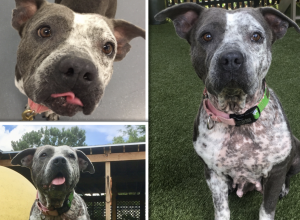 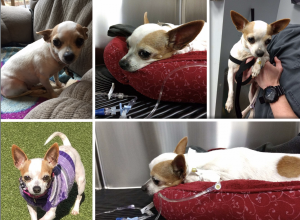 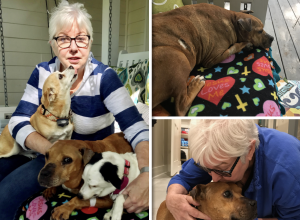 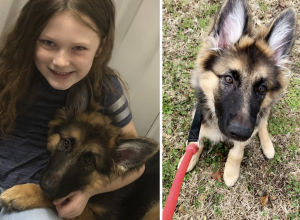 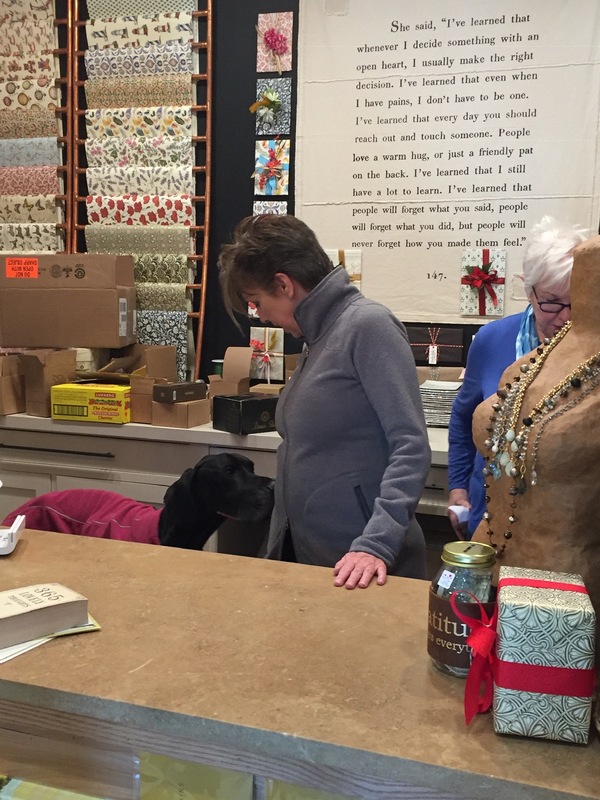 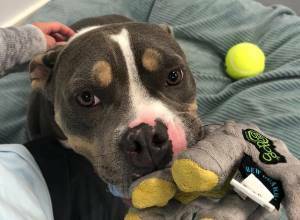 Thanks for caring and giving this special pup the Gift of Life.